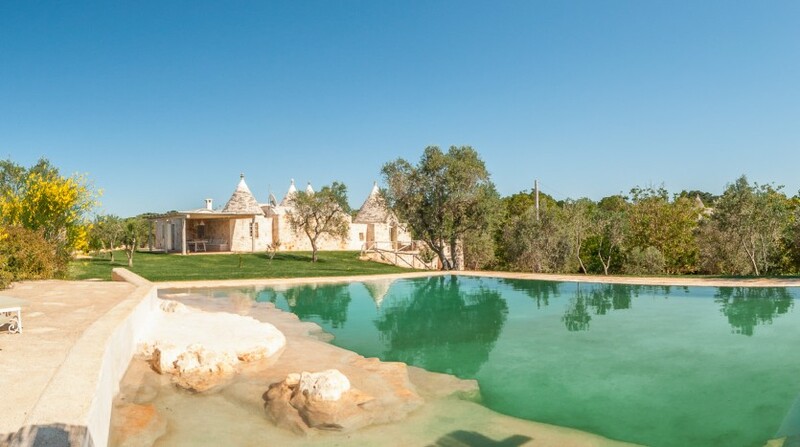 Trulli Tra Pietre is a large luxurious complex of trulli (trulli are traditional Apulian dry stone huts with a conical roof) located in the lush countryside between Ceglie Messapica and Martina Franca, with a very particular infinity pool carved into the rocks. 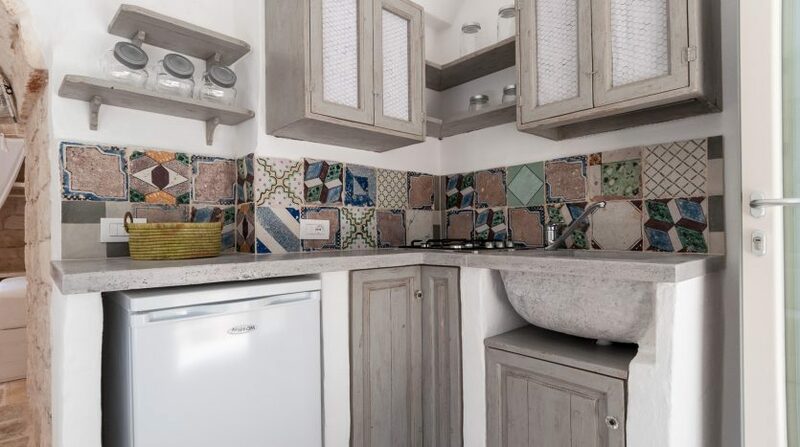 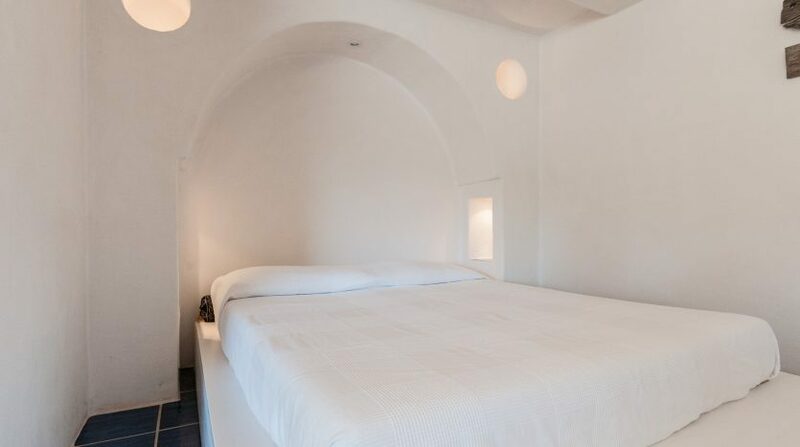 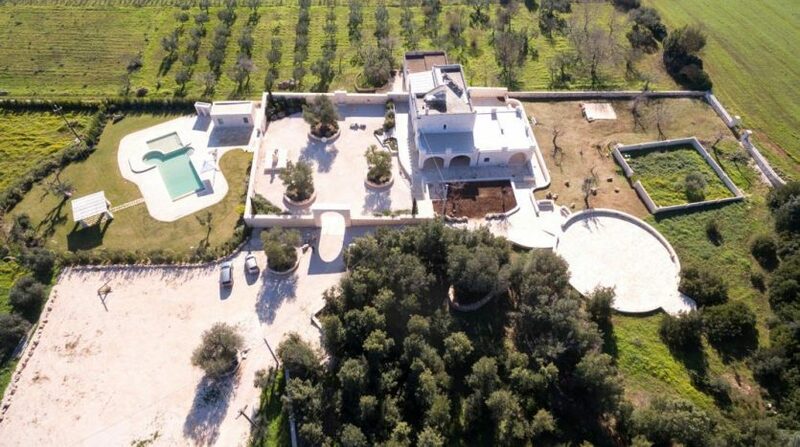 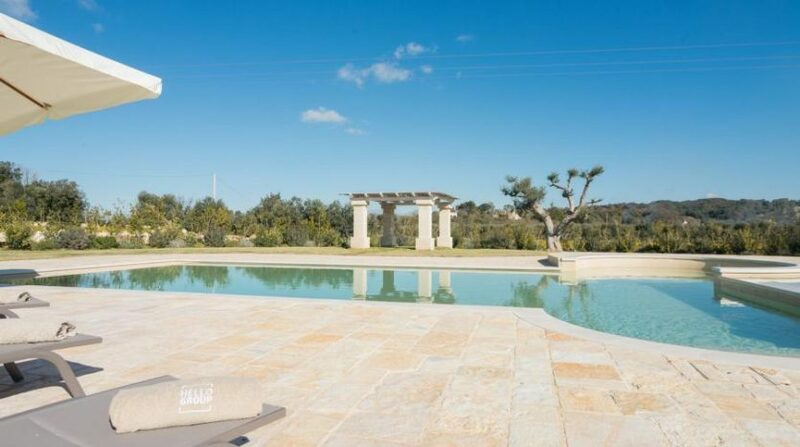 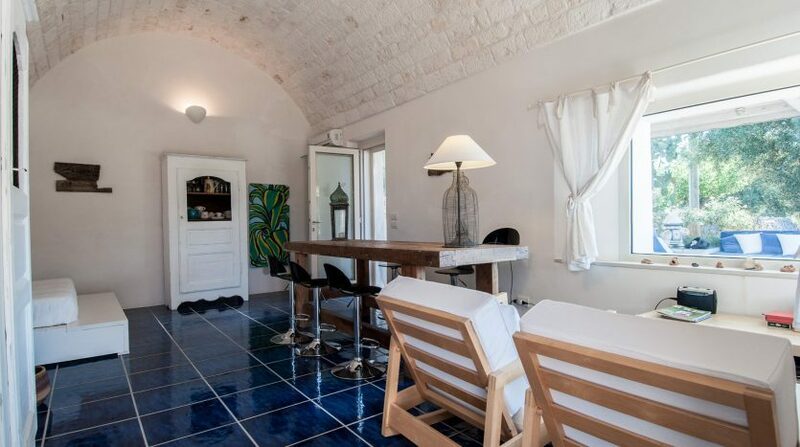 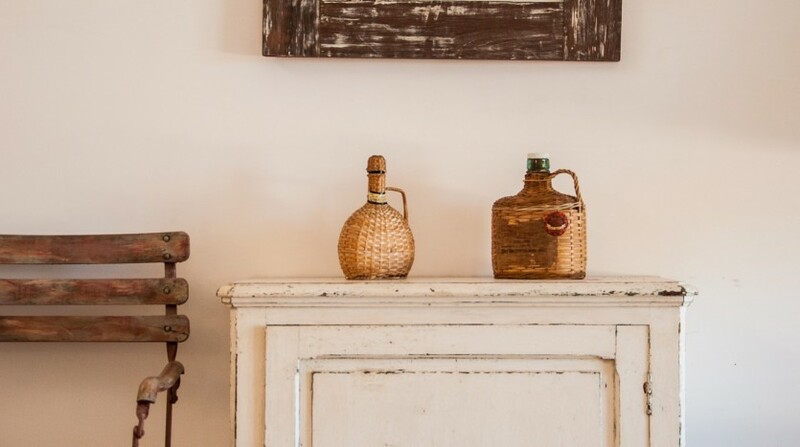 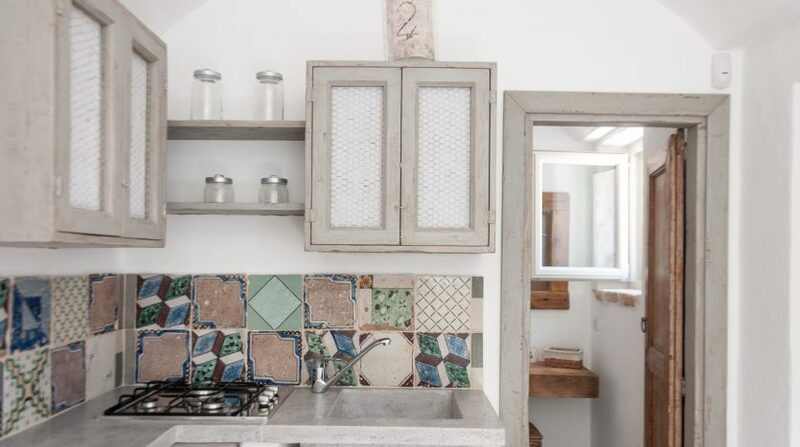 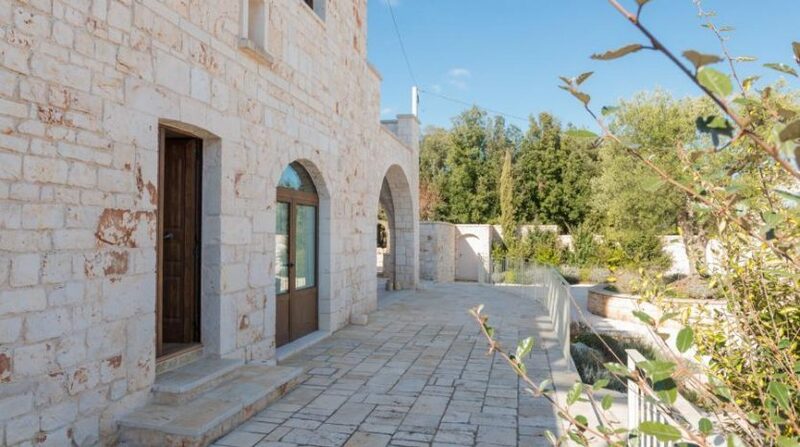 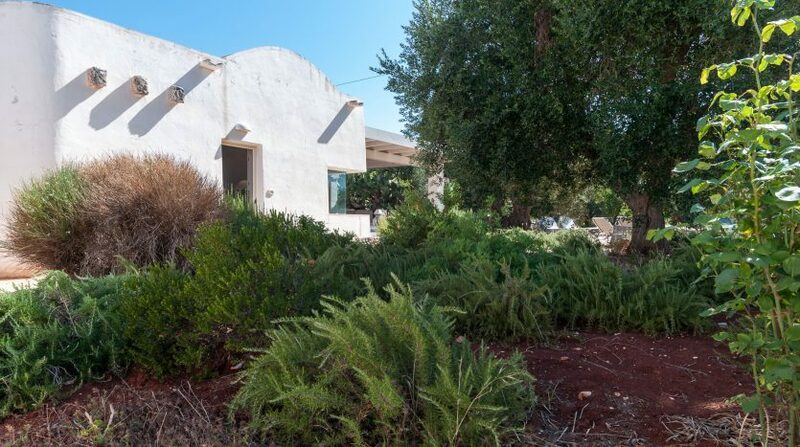 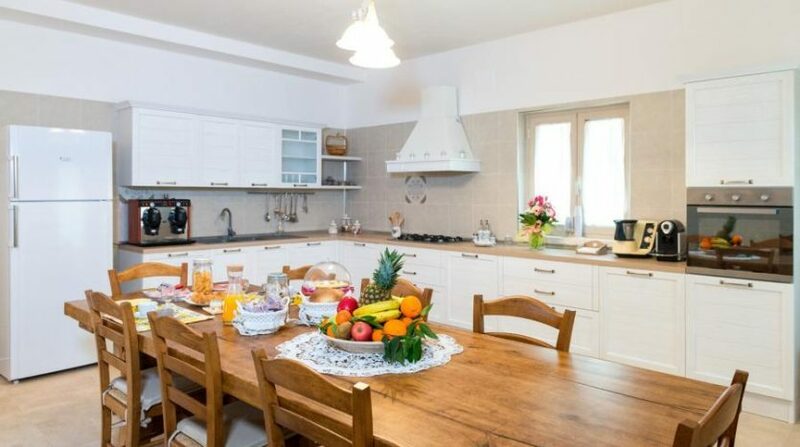 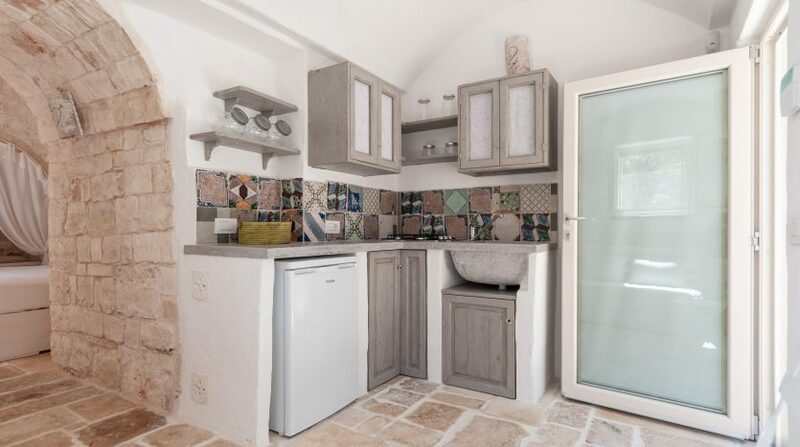 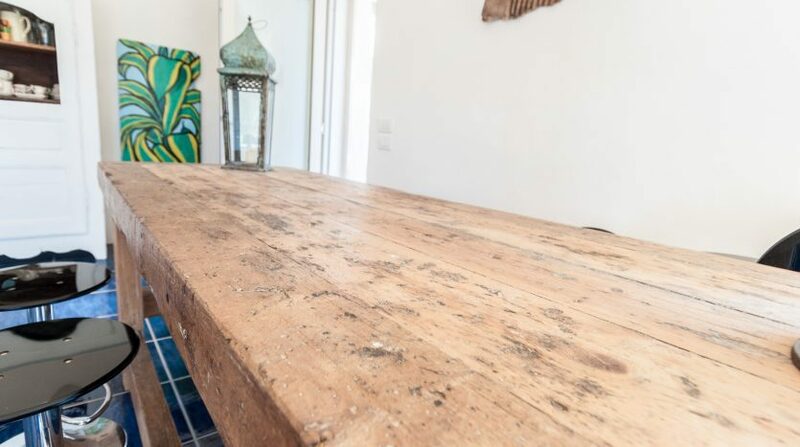 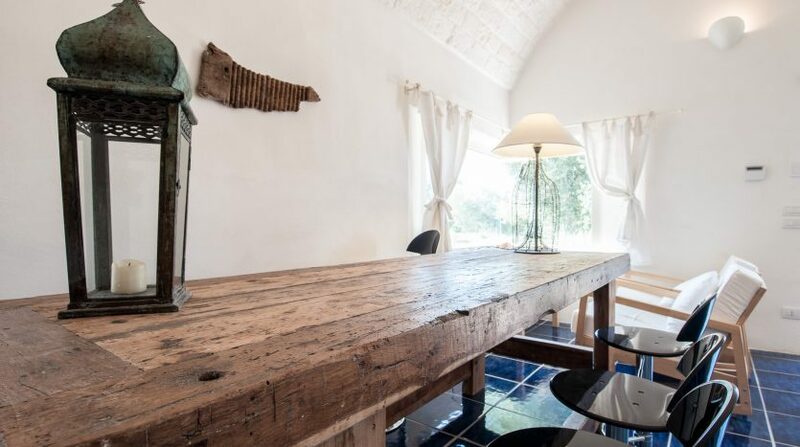 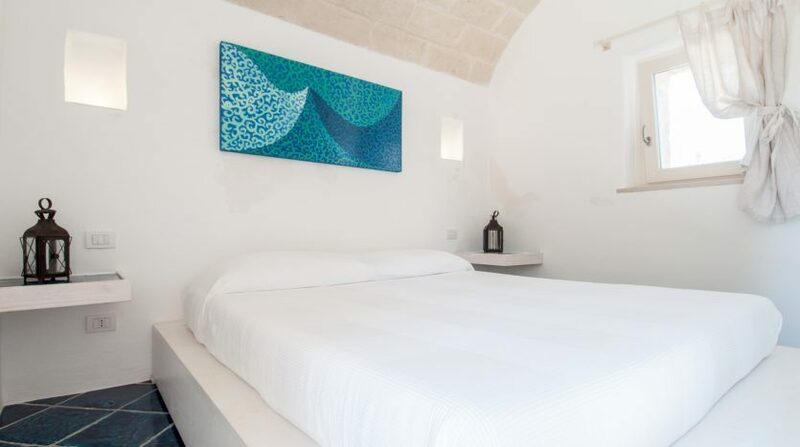 This wonderful holiday home has been carefully renovated while fully respecting the conservative criteria and with the highest professional rigour, in order to offer a comfortable luxury villa that reflects, at the same time, the most authentic Apulian stylistic standards. 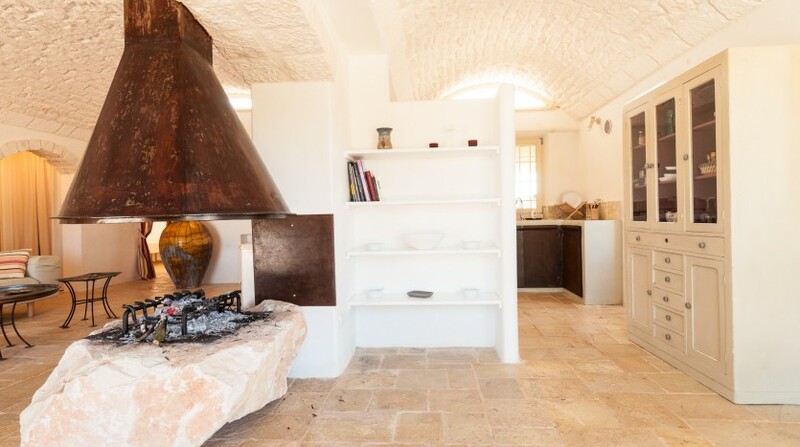 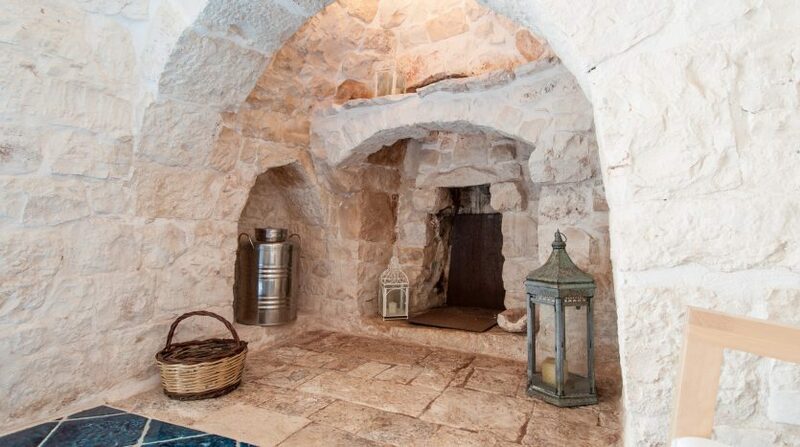 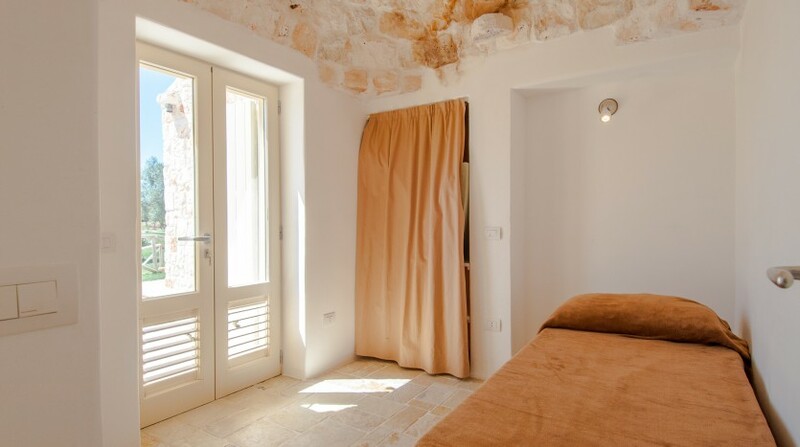 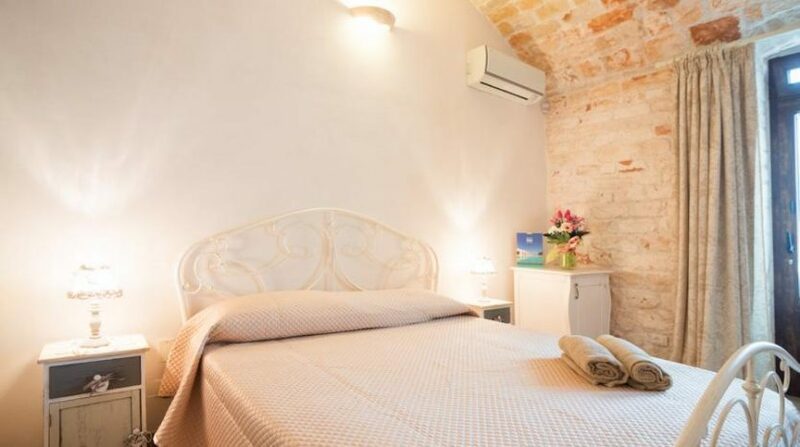 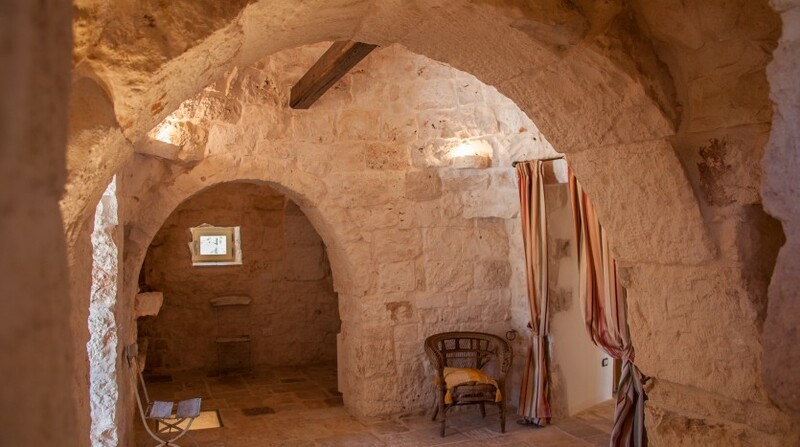 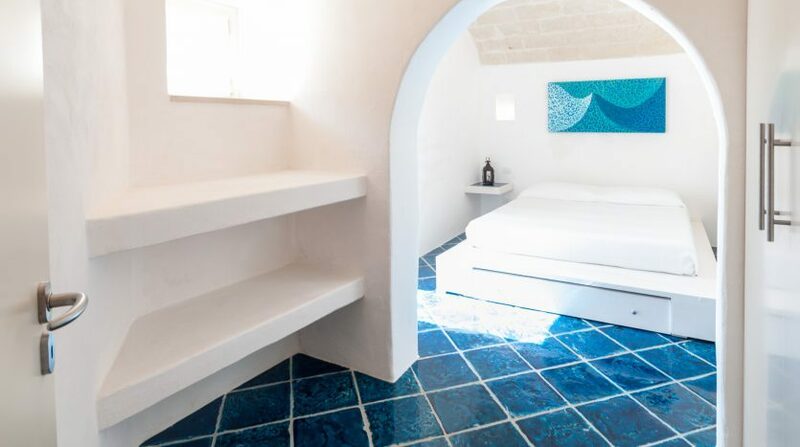 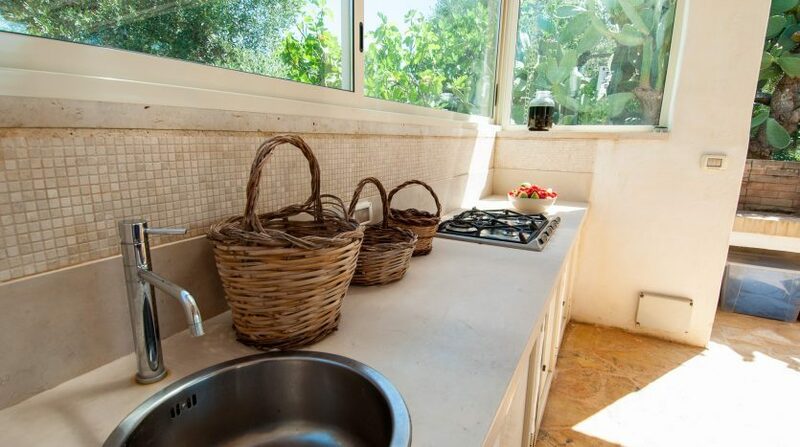 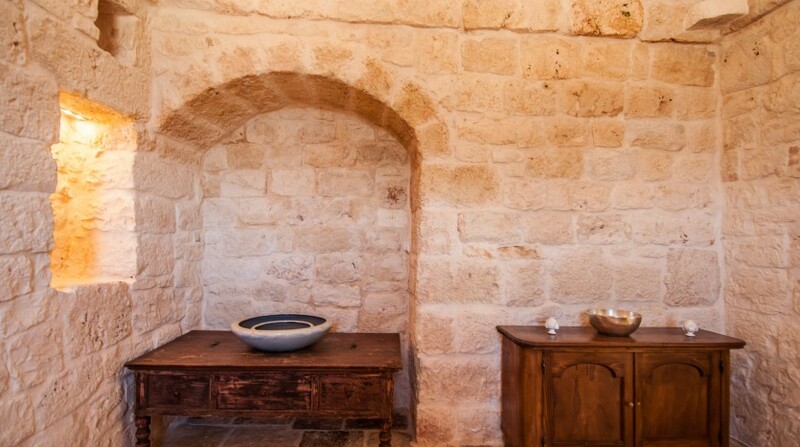 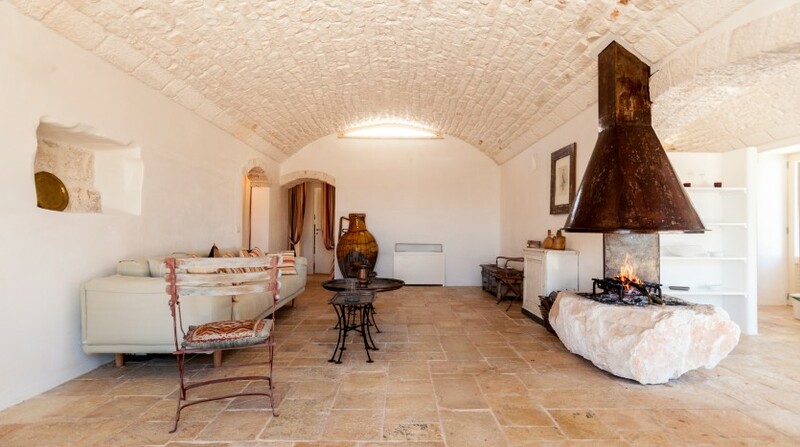 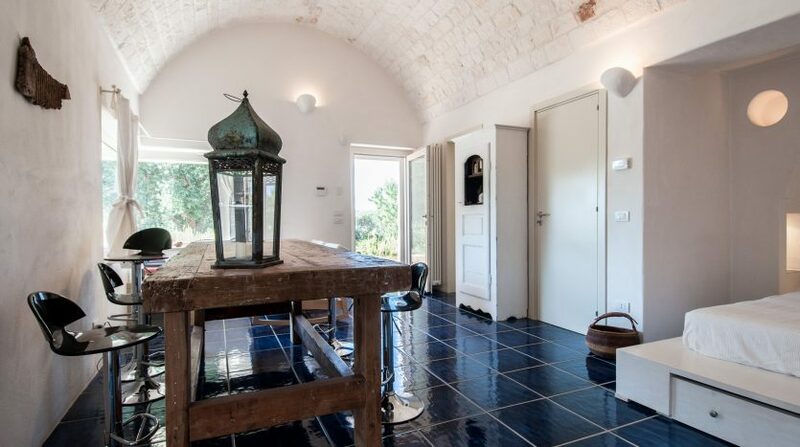 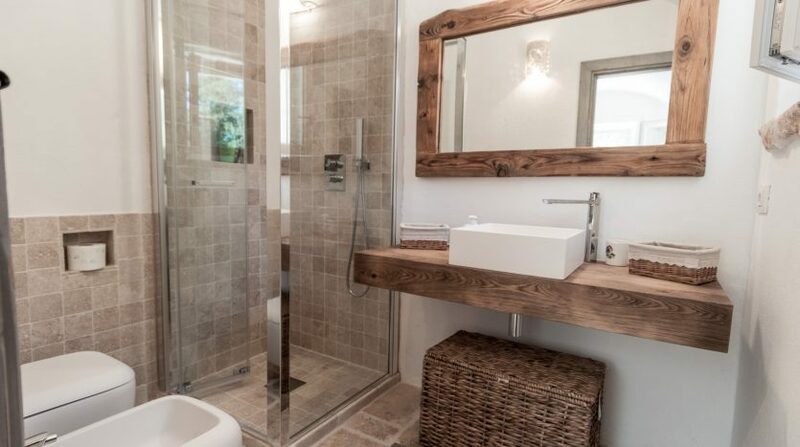 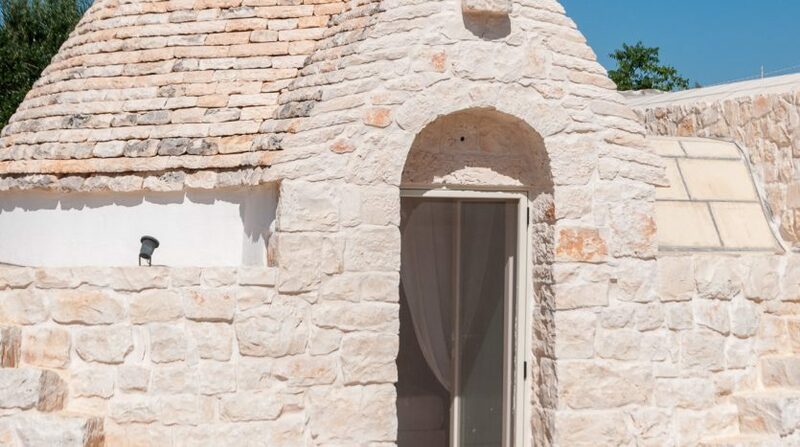 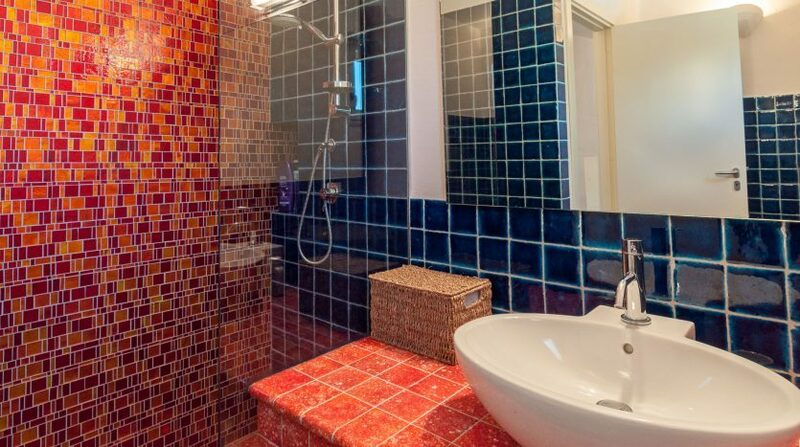 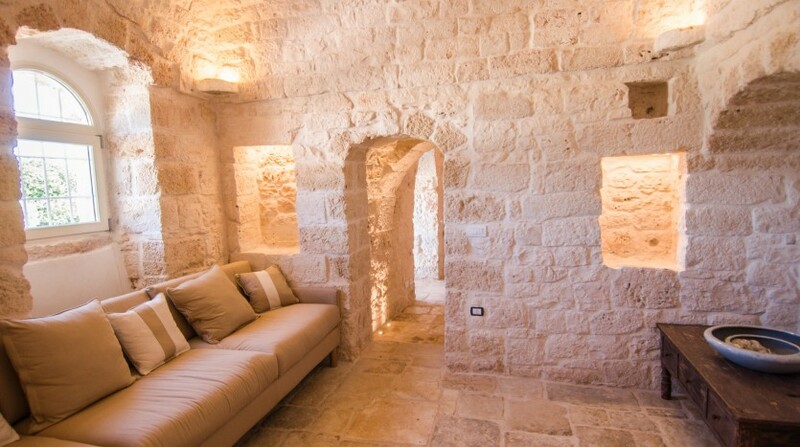 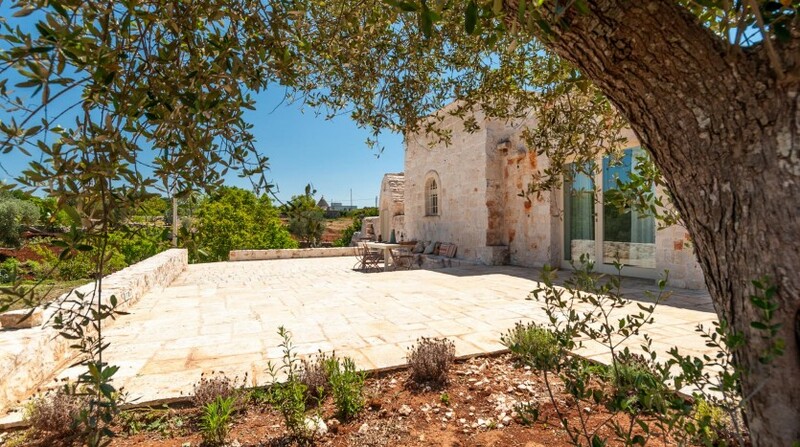 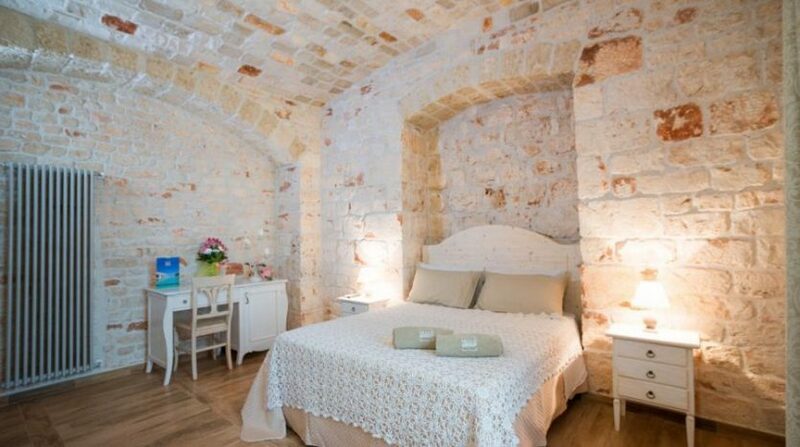 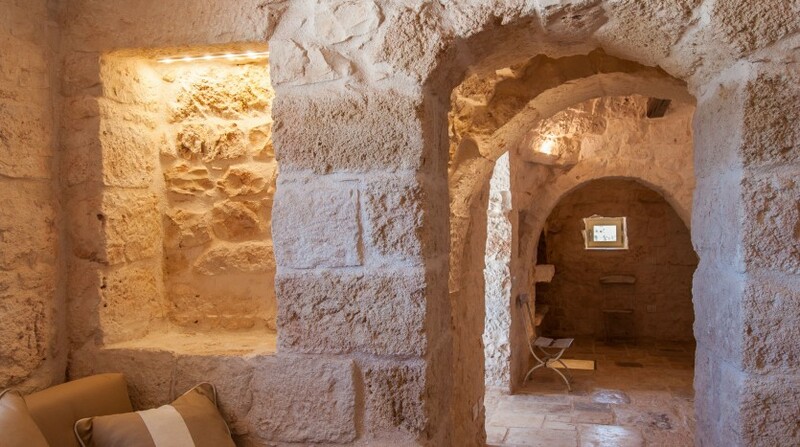 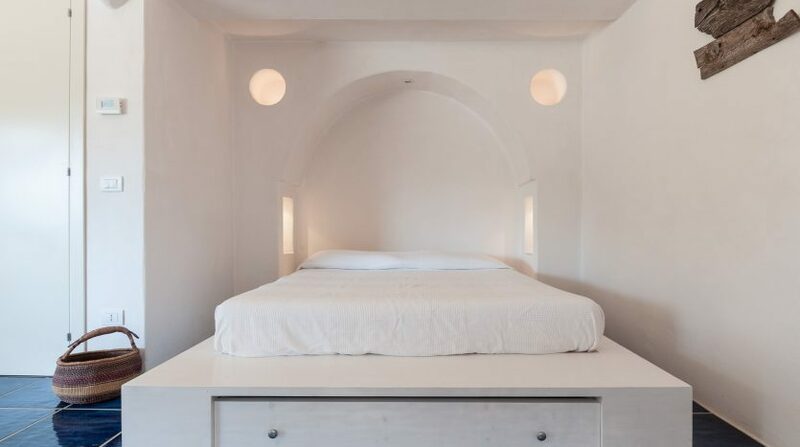 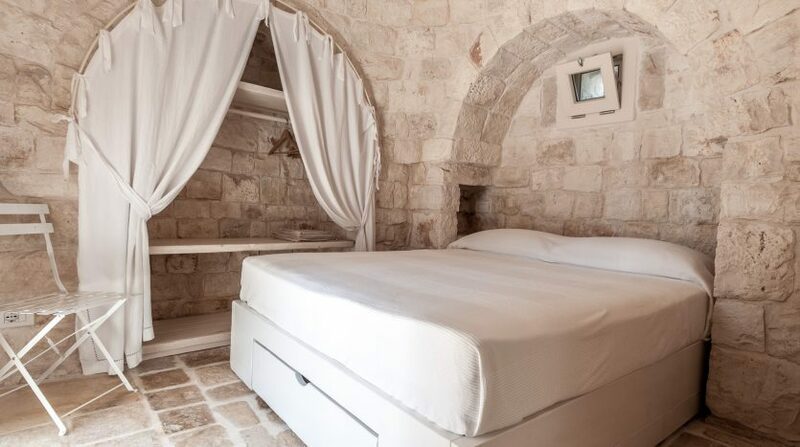 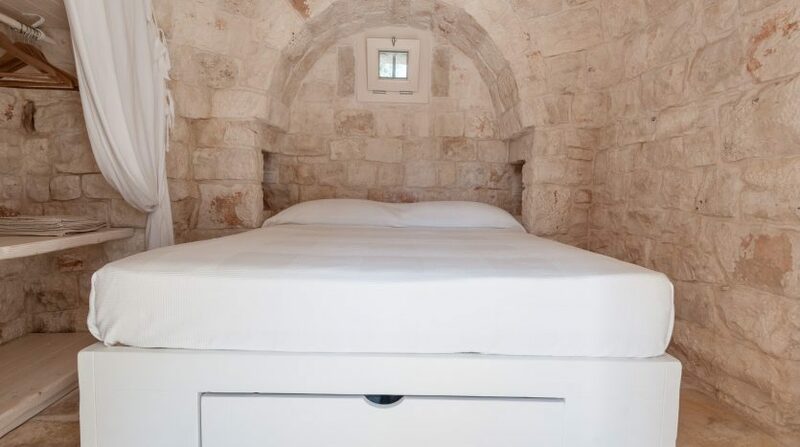 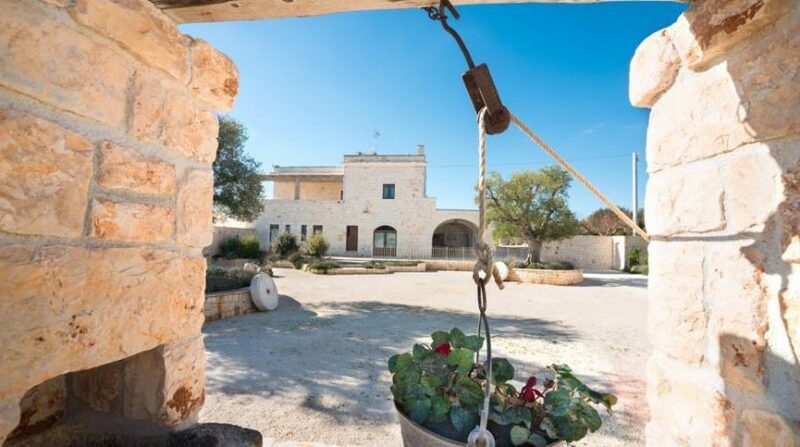 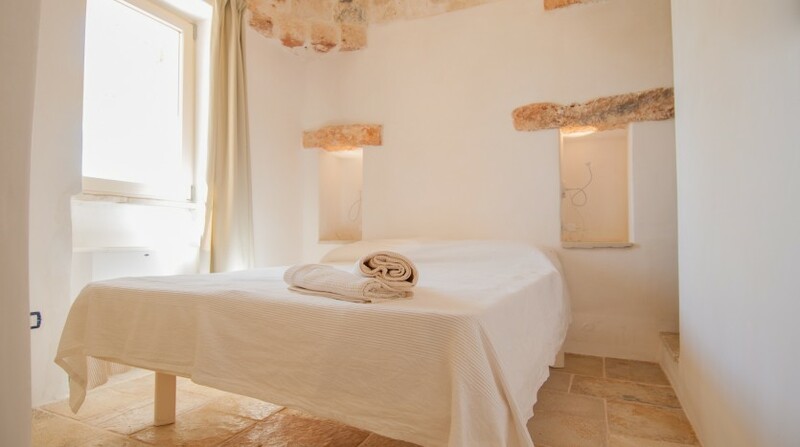 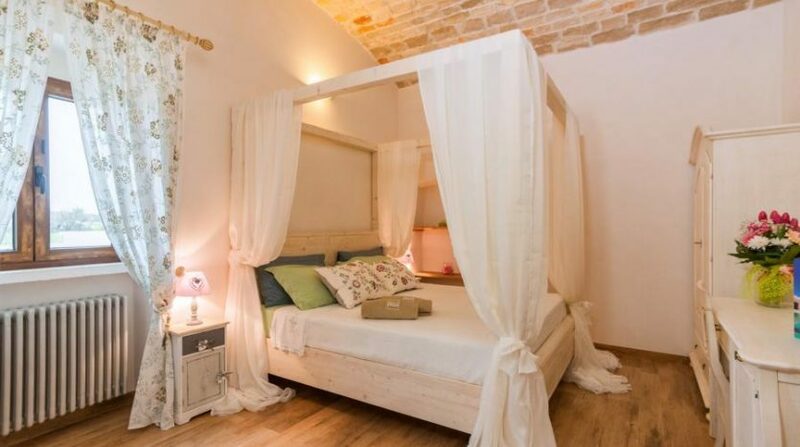 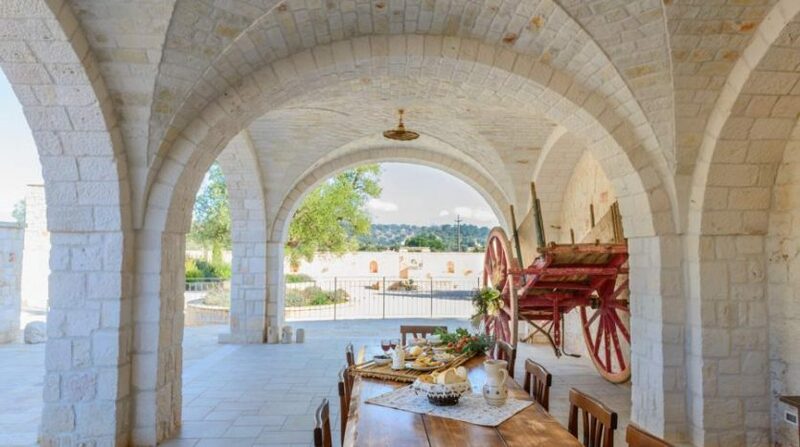 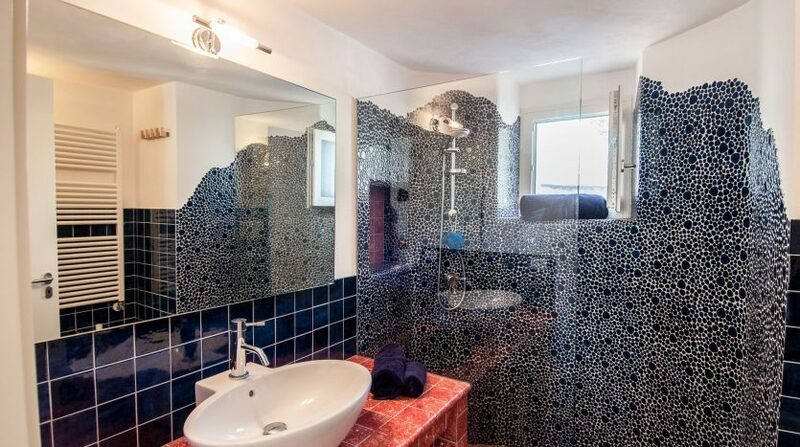 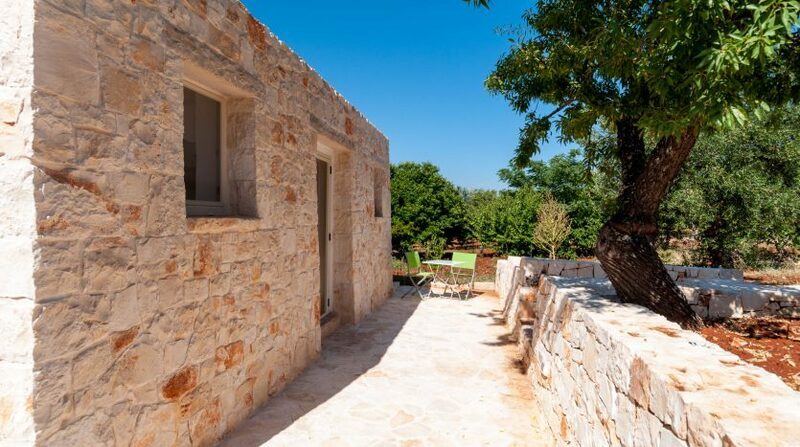 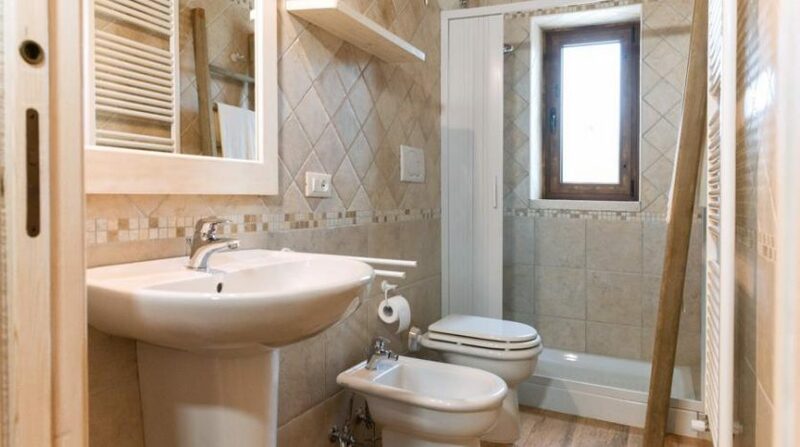 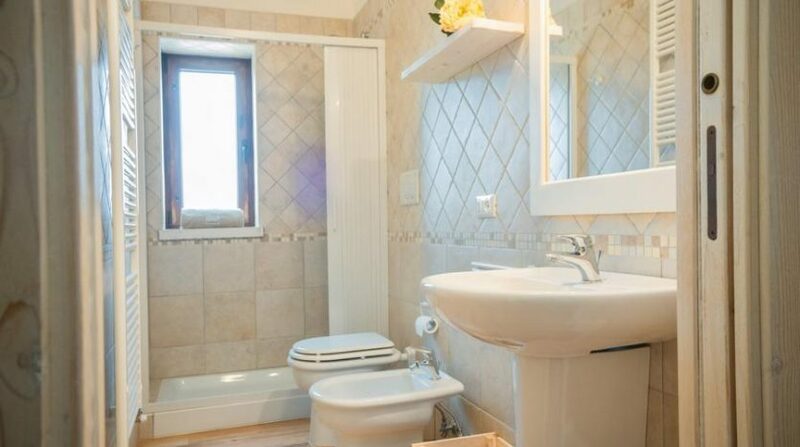 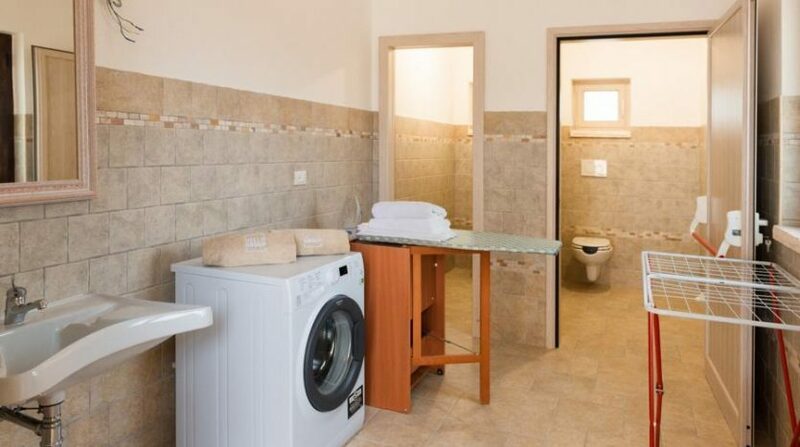 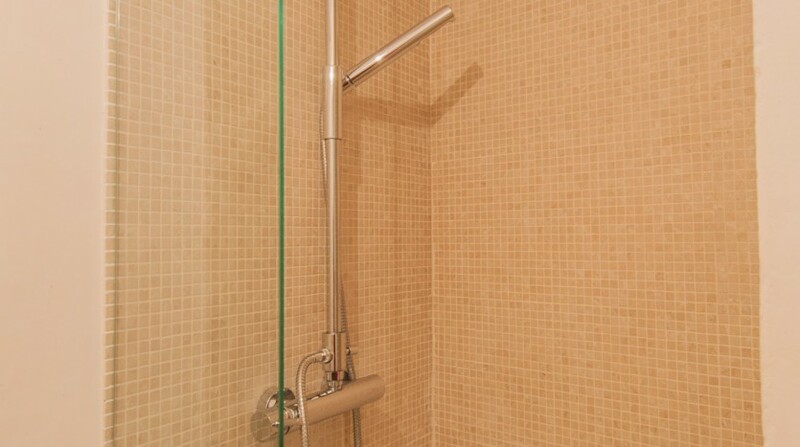 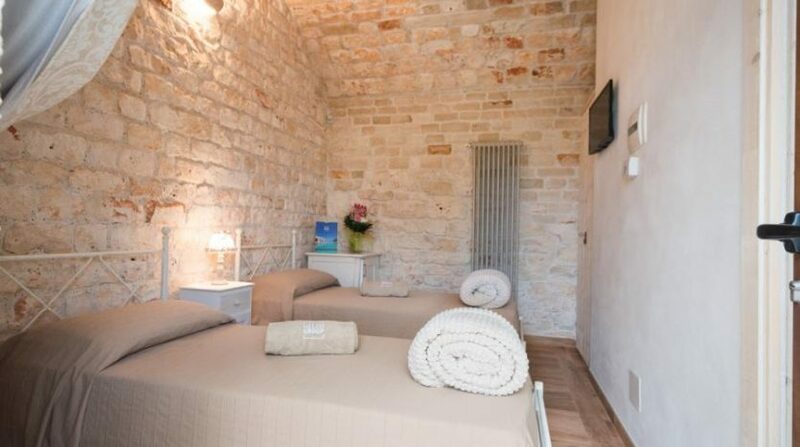 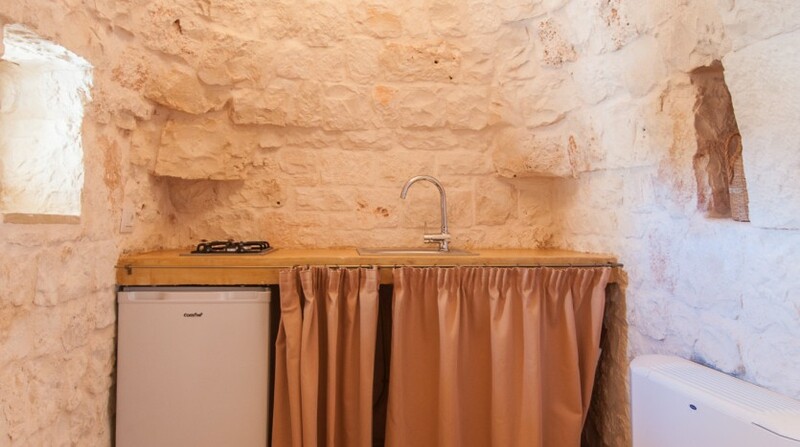 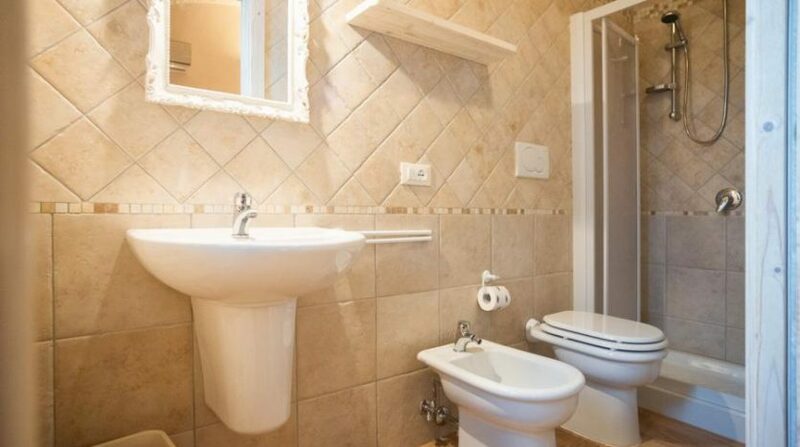 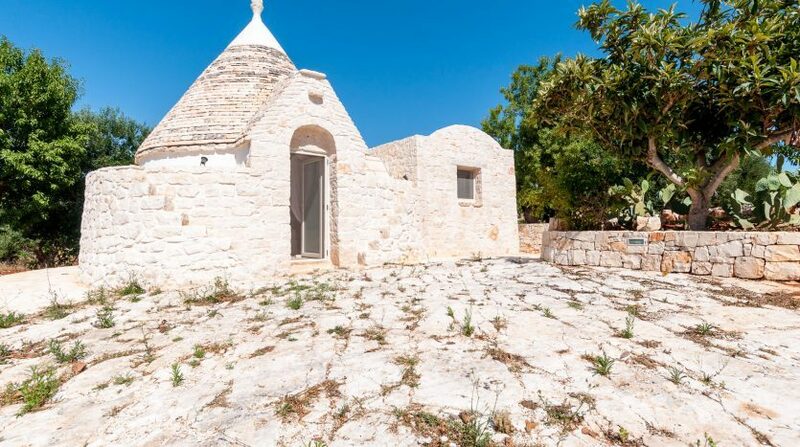 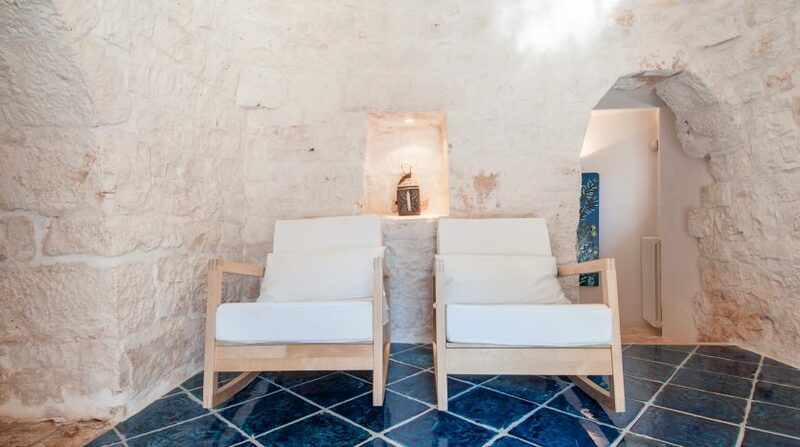 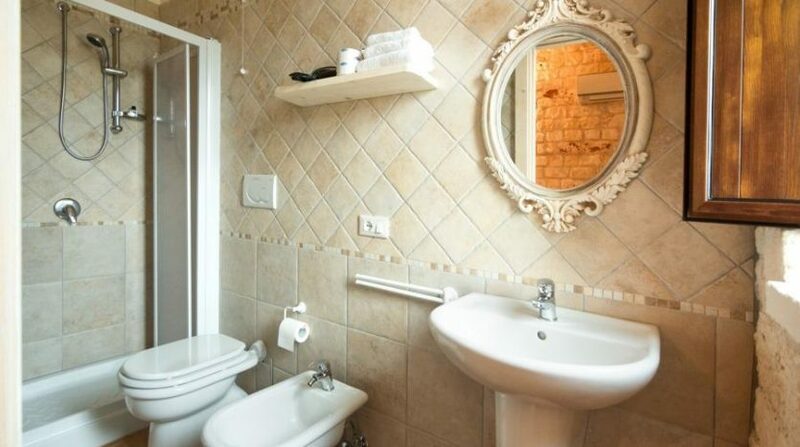 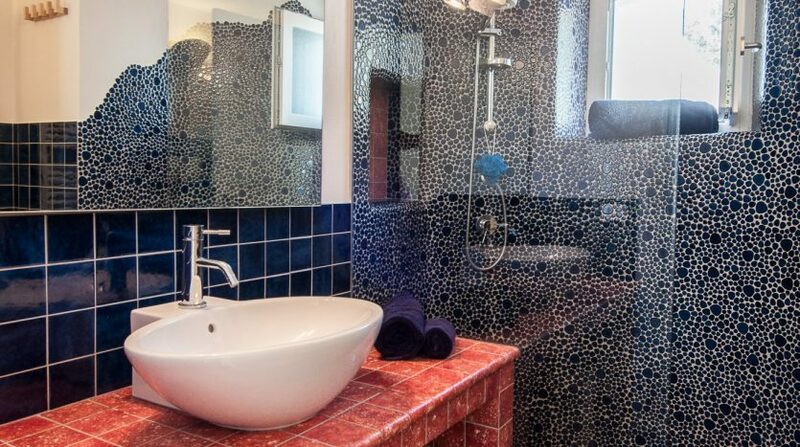 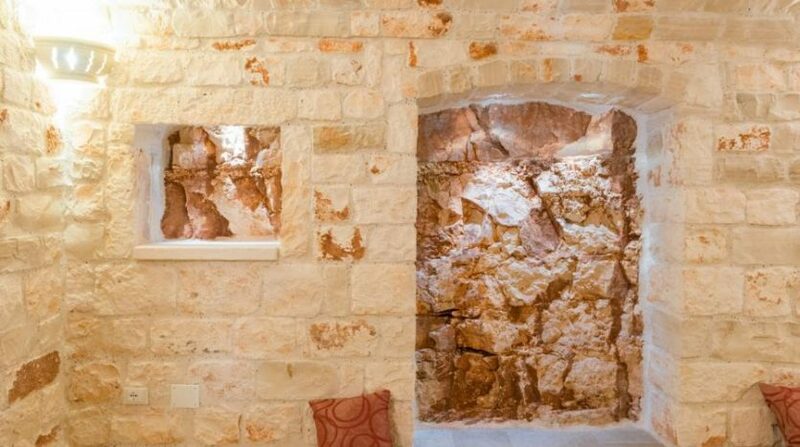 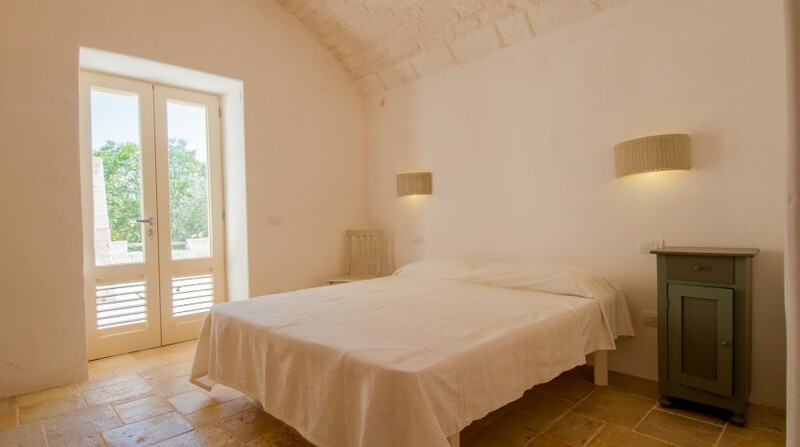 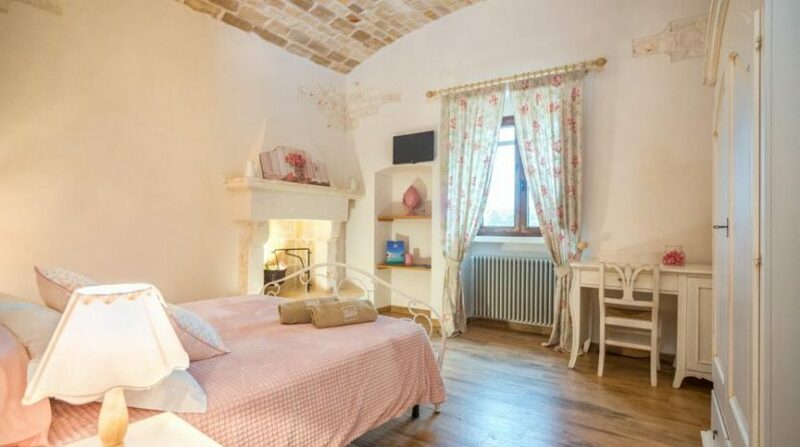 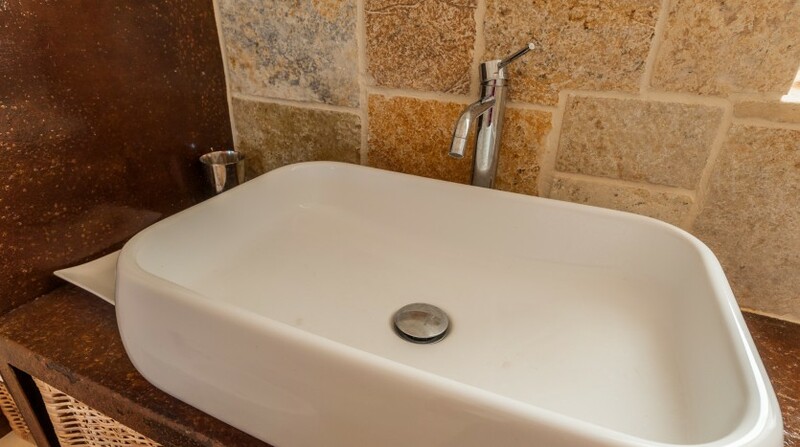 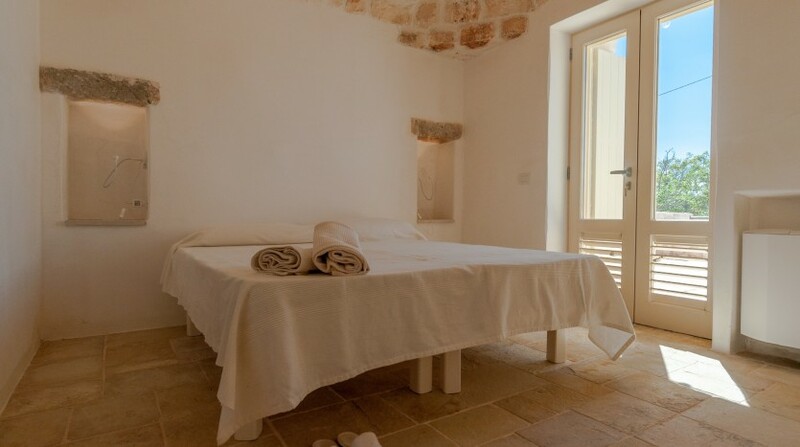 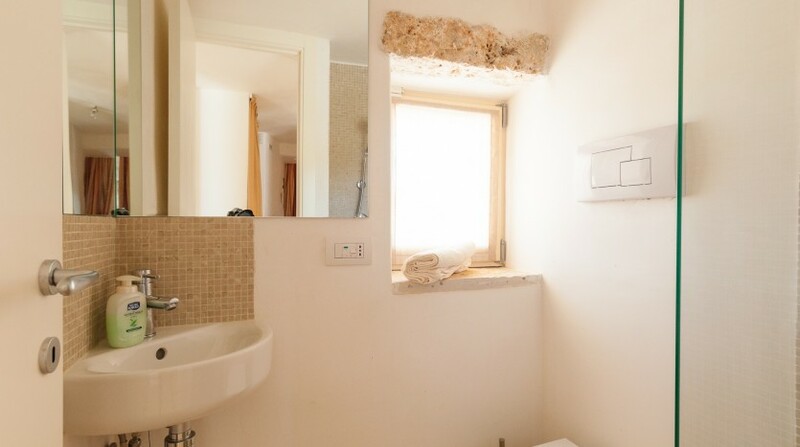 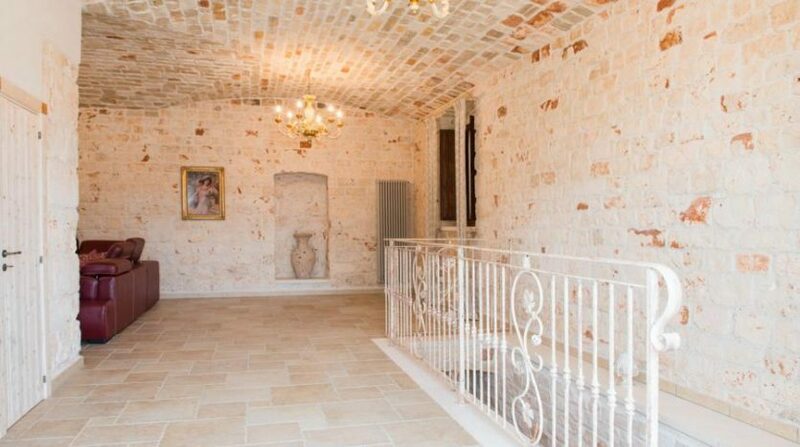 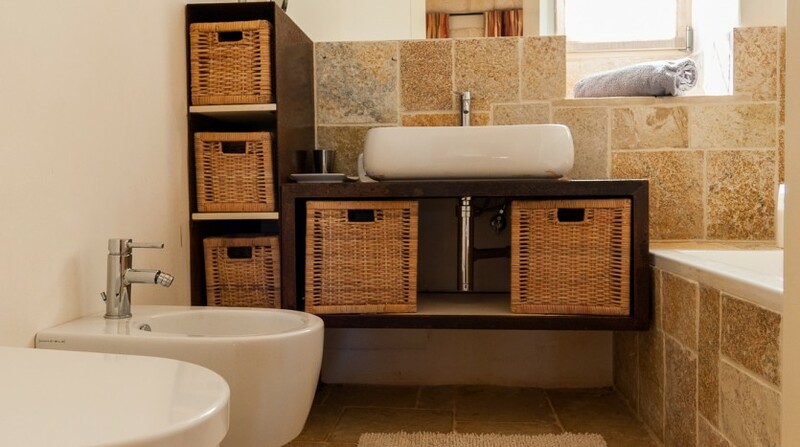 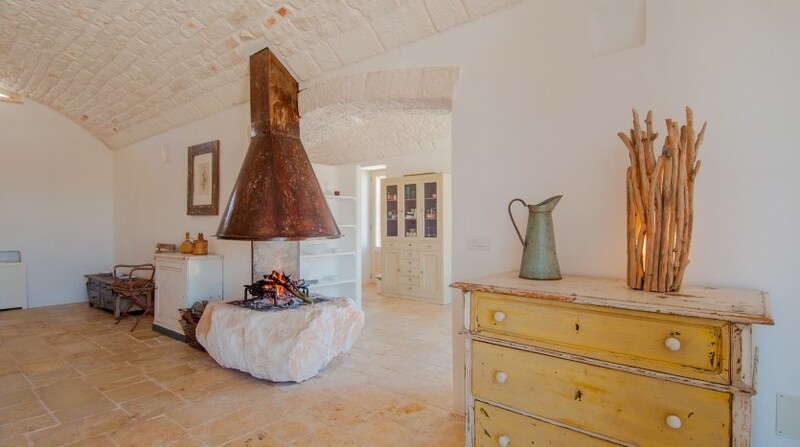 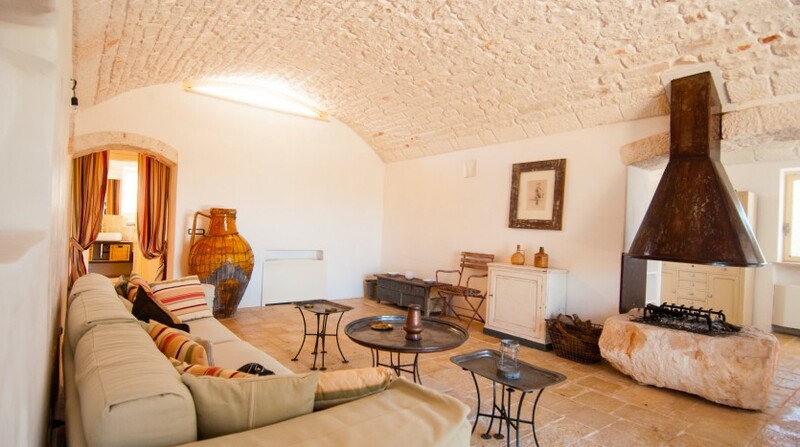 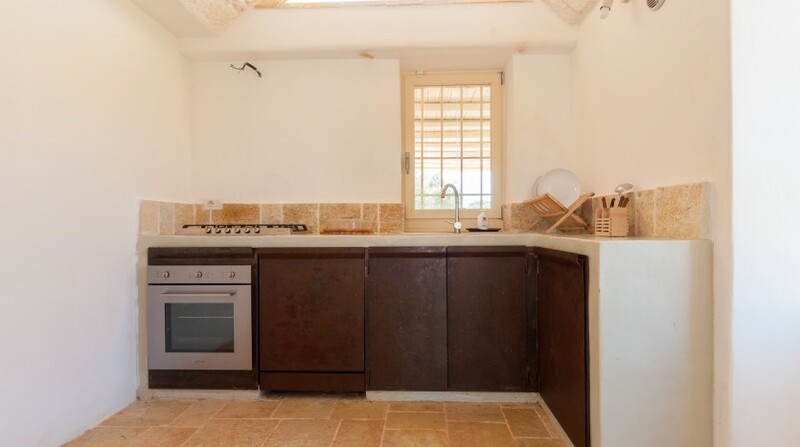 Trulli Tra Pietre can comfortably accommodate up to 13 people in 7 bedrooms, each of which has an ensuite bathroom. 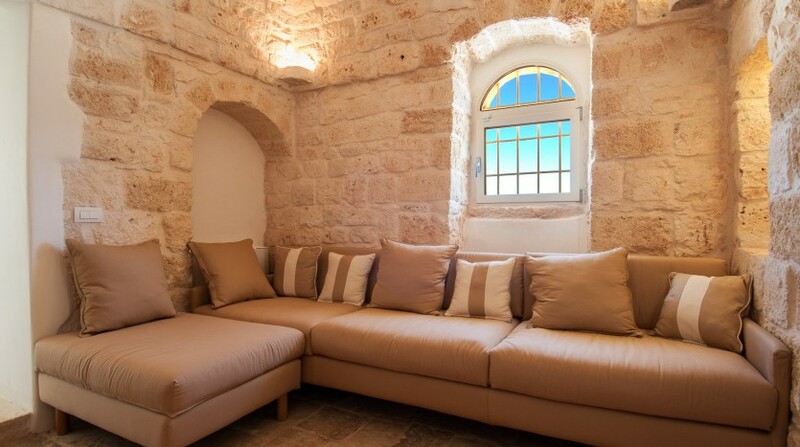 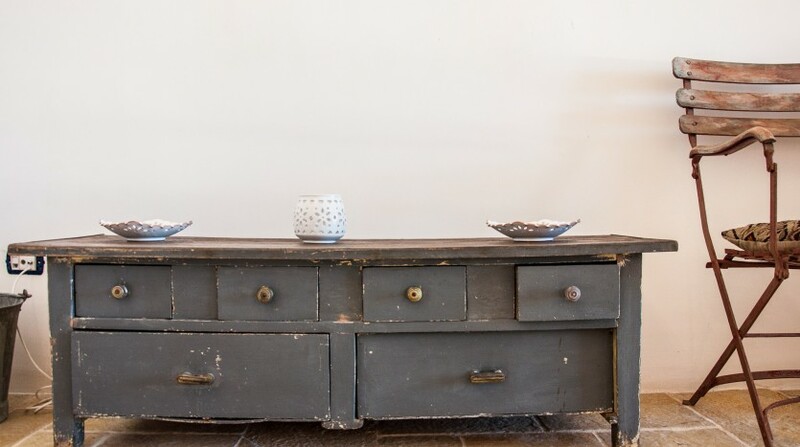 The interiors, which are furnished with fine furniture in rustic-style, are composed of a main building and an annex. 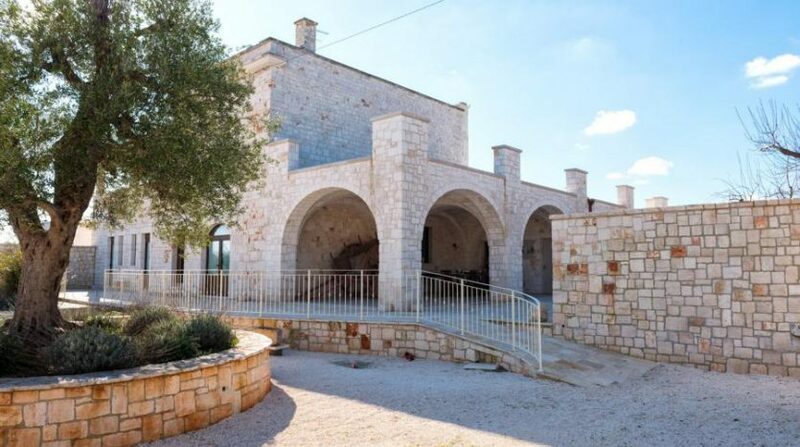 The main building is divided into two areas. 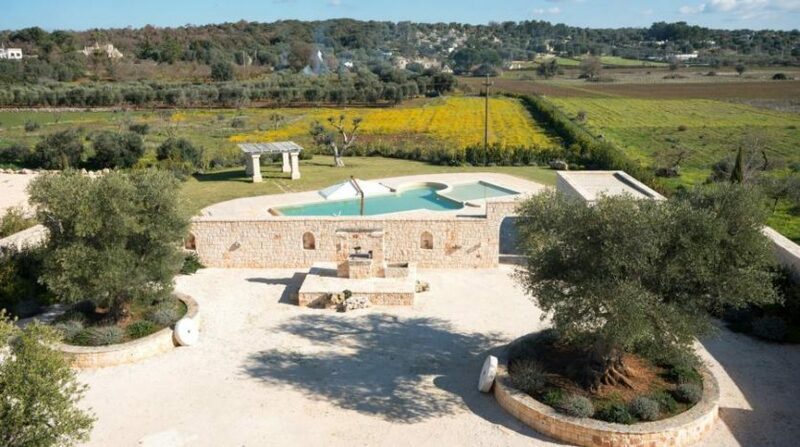 The first one includes a living area with a unique open fireplace, sofa, small armchairs and a large LED TV screen; a dining area; a well-equipped kitchen with natural stone walls; a bathroom with shower; a main bedroom suite with ensuite bathroom; a room with a three-quarter bed overlooking the pool area; a twin bedroom (it is possible to join the two single beds, if necessary); a shared bathroom with bathtub for those staying in the two bedrooms. 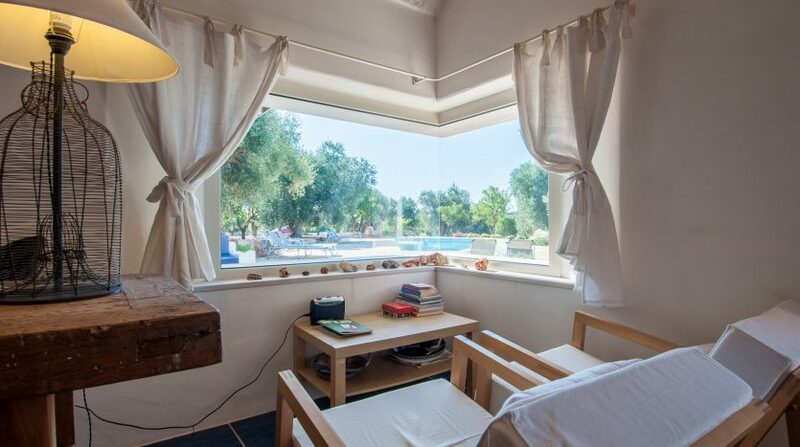 The second area of ​​the main building welcomes you into a living area with natural stone walls, equipped with a large corner sofa and a LED TV; a small hallway with a sofa; a bedroom with two single beds overlooking the pool area; a bathroom with shower for those staying in the twin bedroom; a double bedroom with ensuite bathroom and direct views of the pool area. 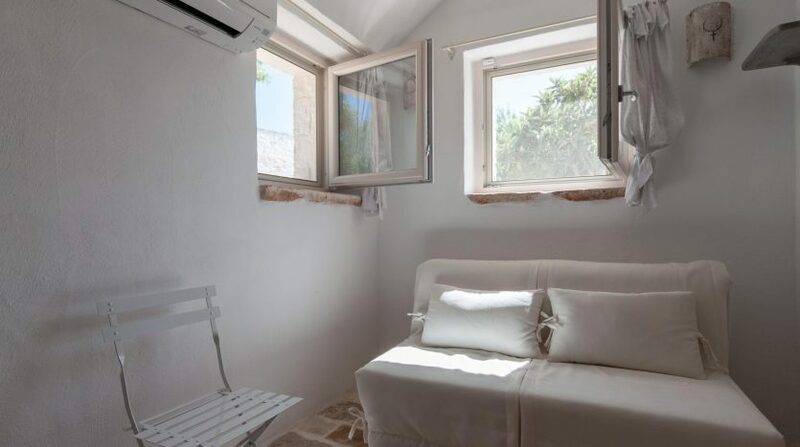 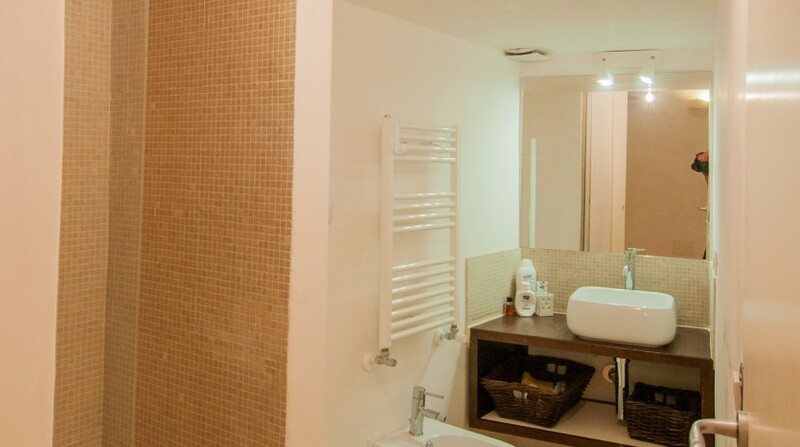 The annex, completely independent and located about 100 m from the main building, consists of a living area with sofa bed, a double bedroom, and a separate bedroom (independent of the previous bedroom) with two single beds, and a bathroom. 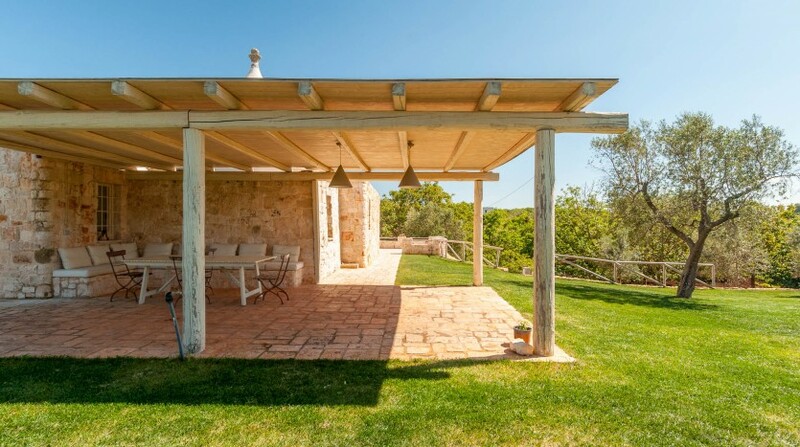 The outdoor area, enriched by a well-kept and lush greenery, is embellished by a large wooden gazebo with a dining table and a large stone bench covered with high quality seat cushions. 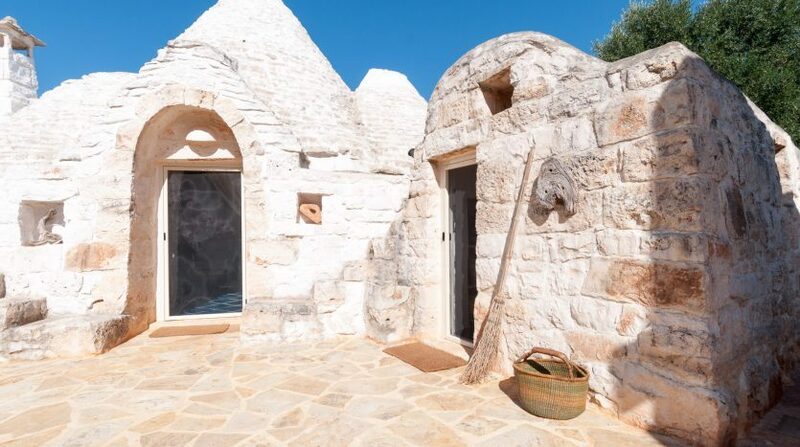 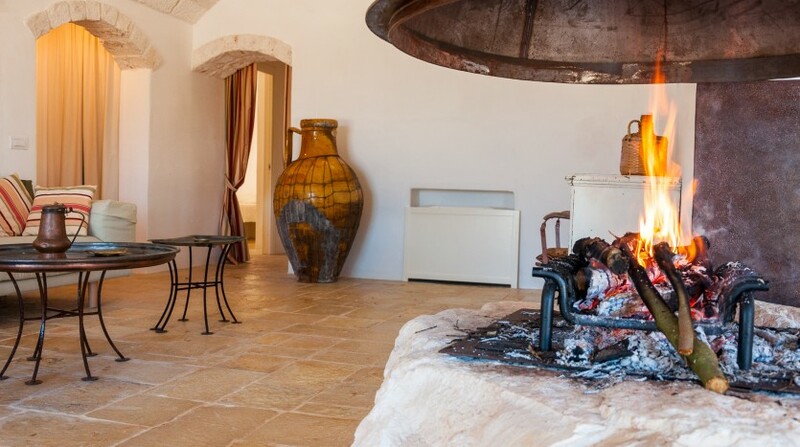 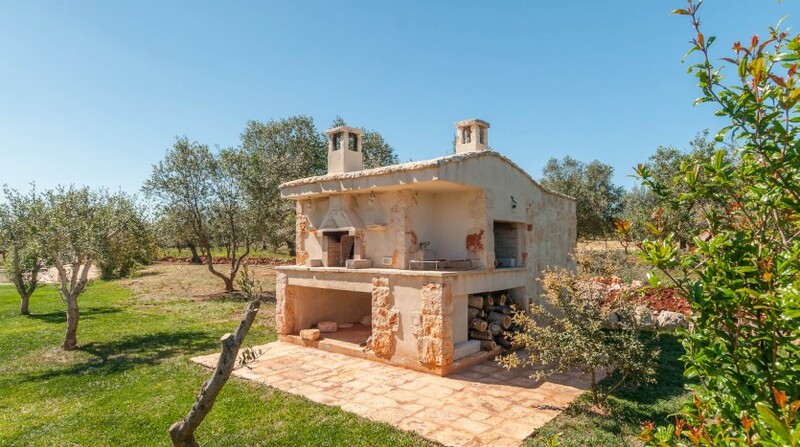 A few metres away, a wood-fired oven and a barbecue enable guests to cook outdoors in the heart of Apulia’s nature. 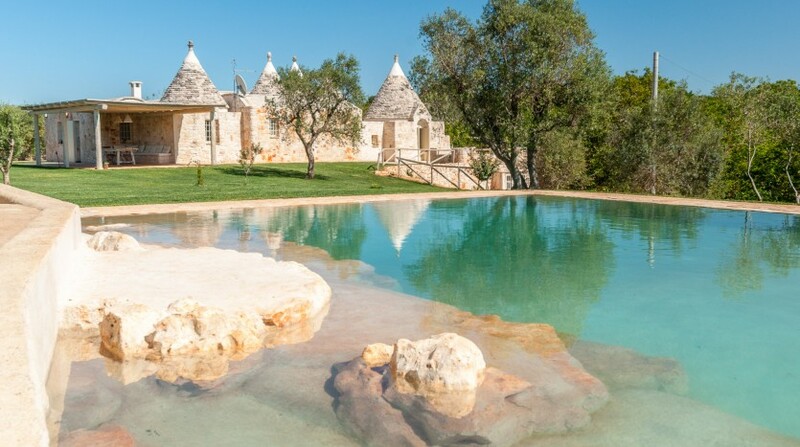 The infinity pool, surrounded by a well-kept lawn decorated with many spotlights, is beautifully cut into the rock, which was levelled to form a small safe area for children and some comfortable seats, partially immersed in water. 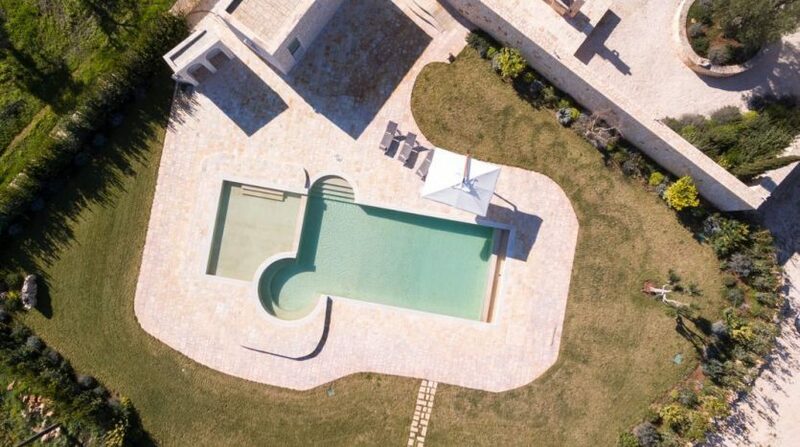 One gets the impression that the pool is an integral part of the landscape and the surrounding nature. 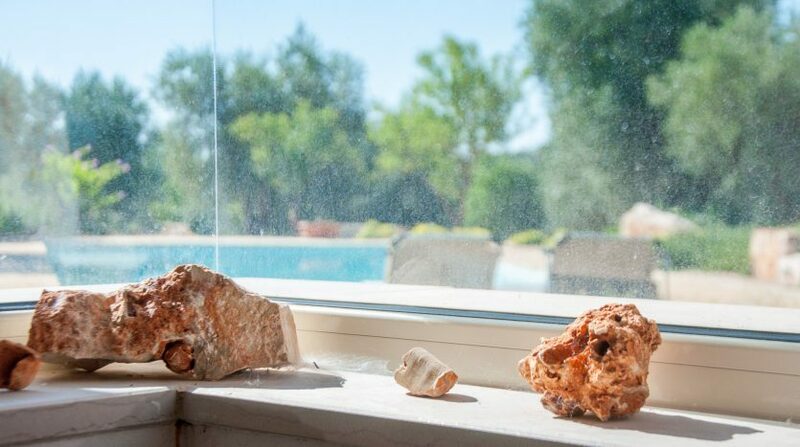 The surveillance system with its outdoor security cameras and a sophisticated alarm system with private security, guarantee guests’ safety and tranquillity. 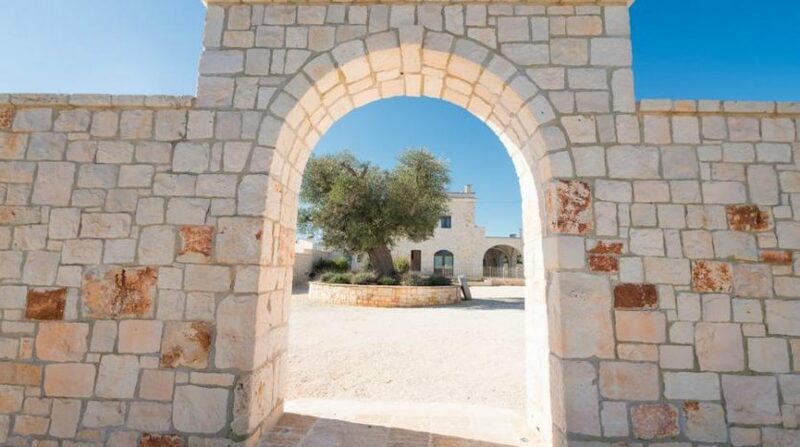 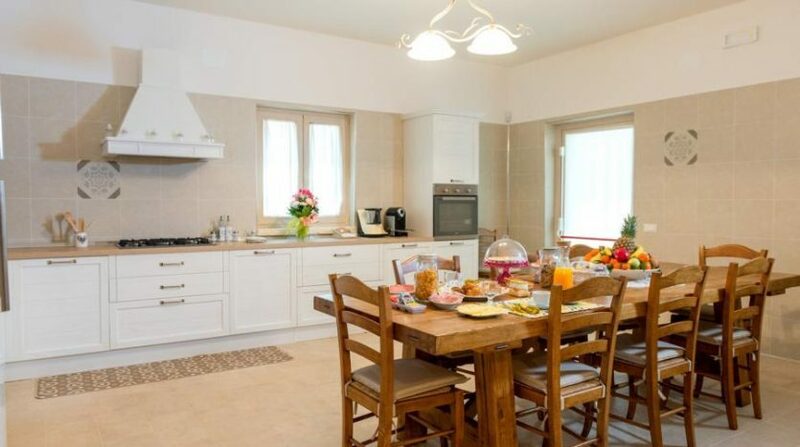 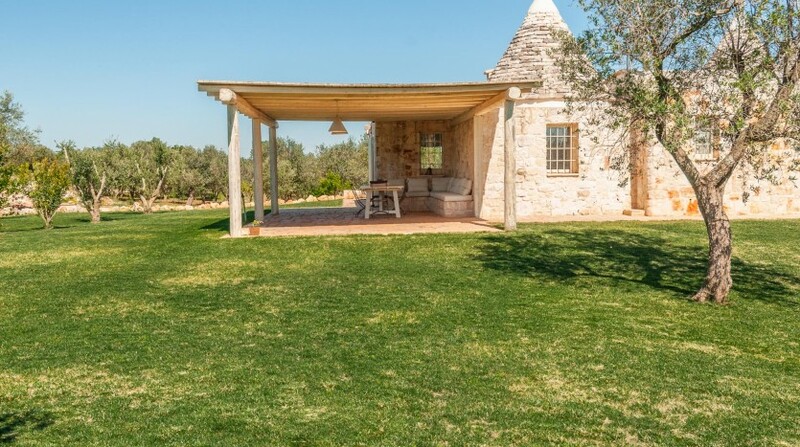 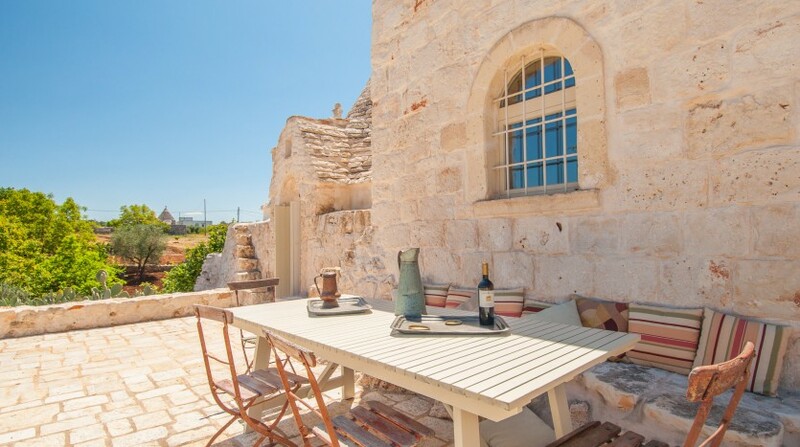 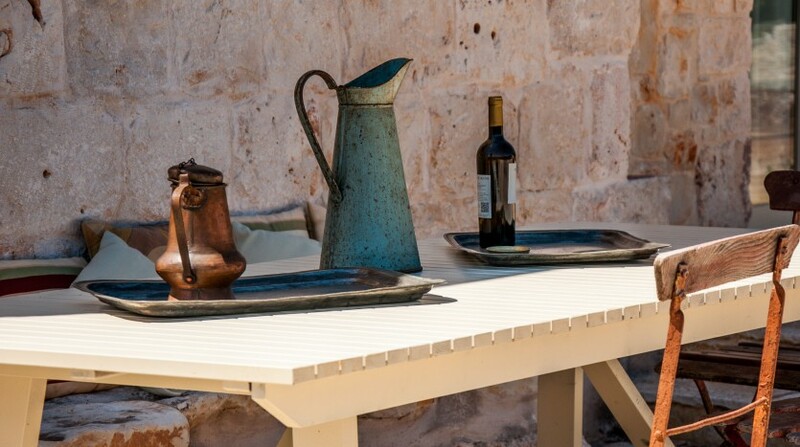 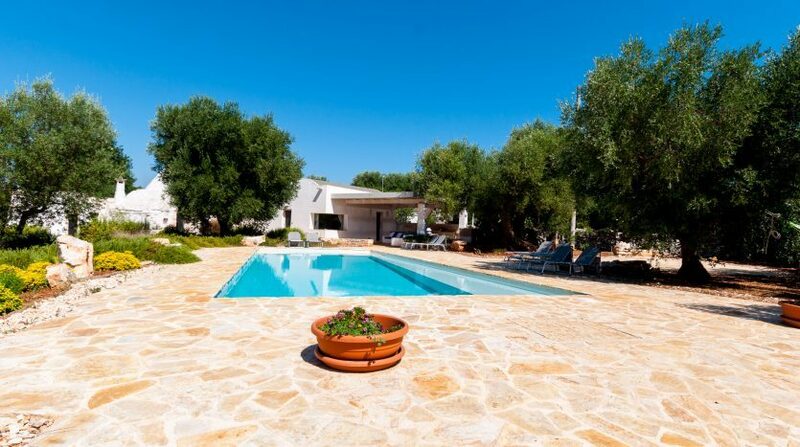 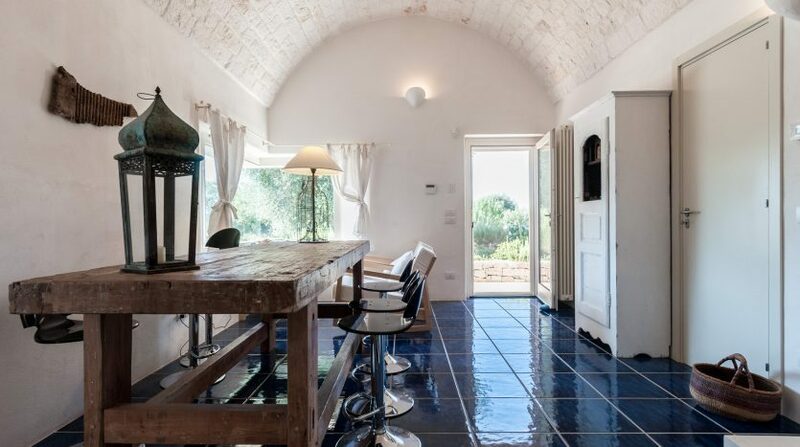 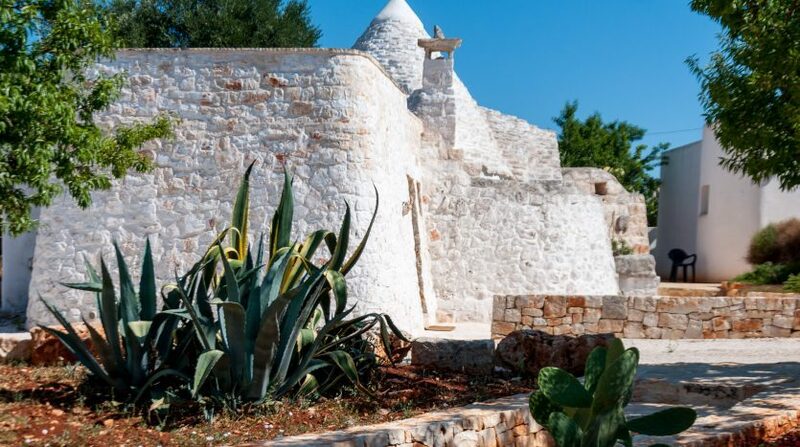 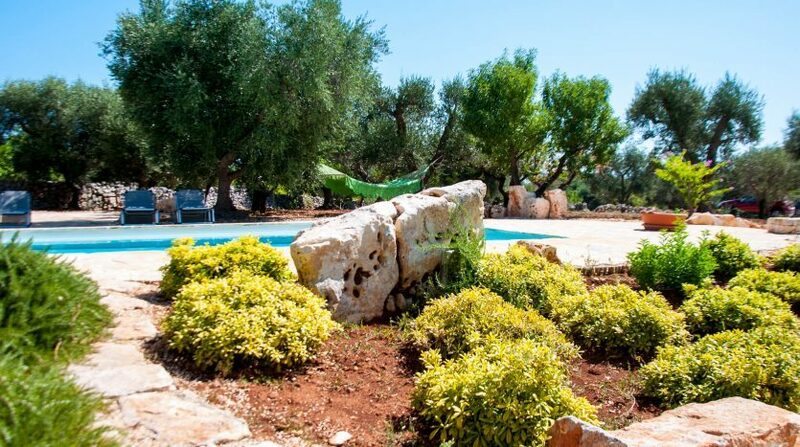 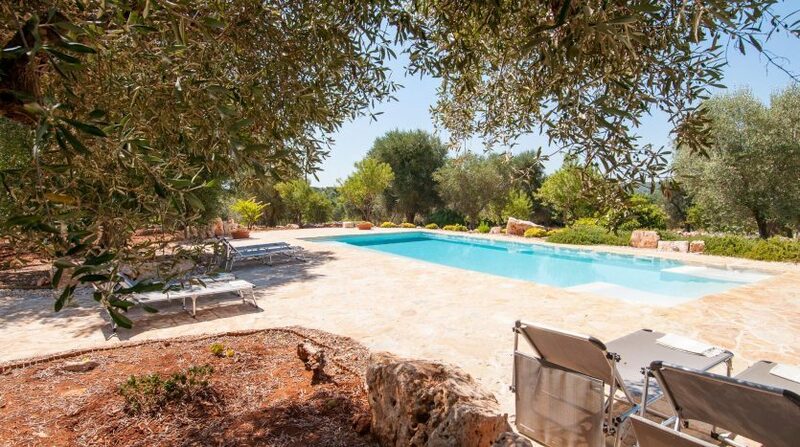 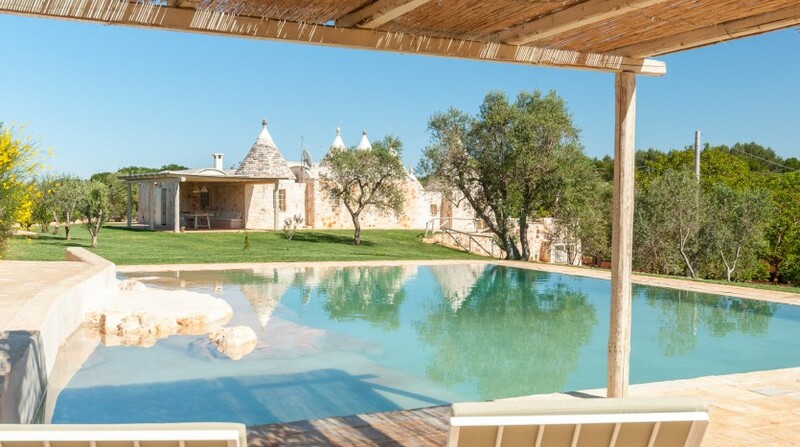 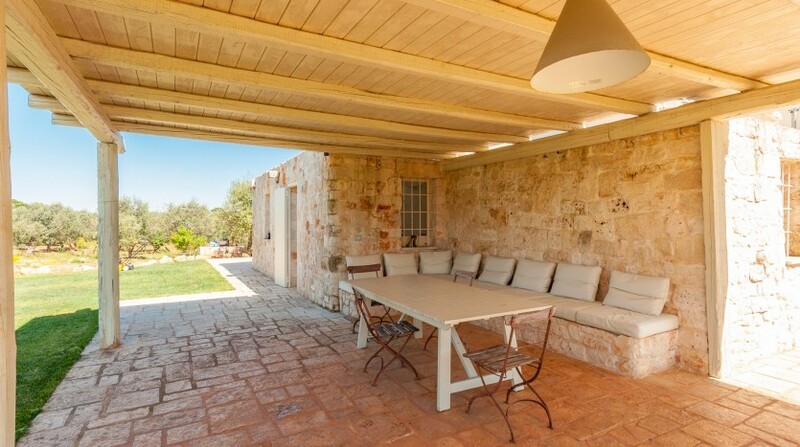 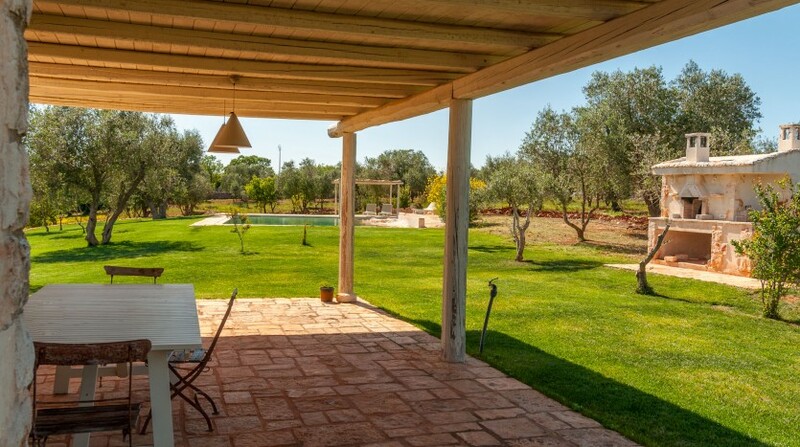 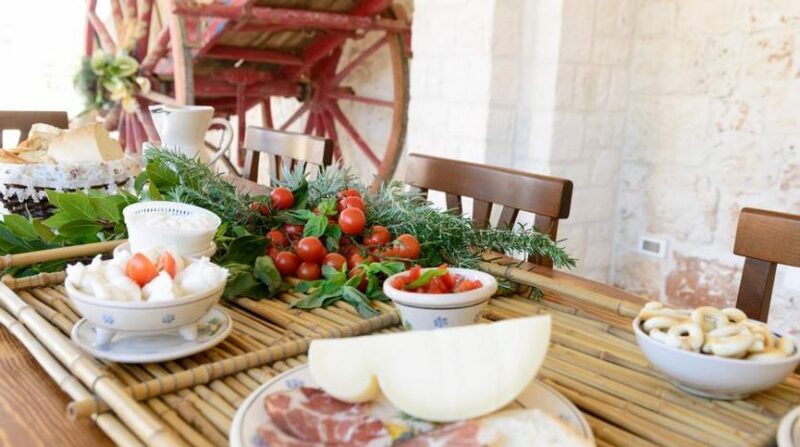 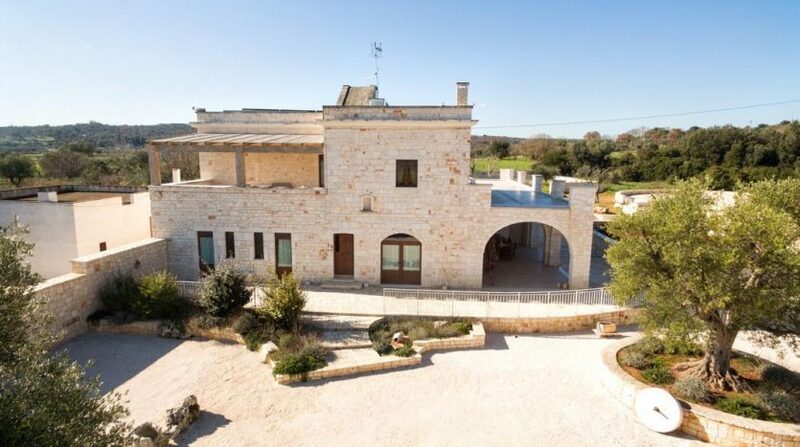 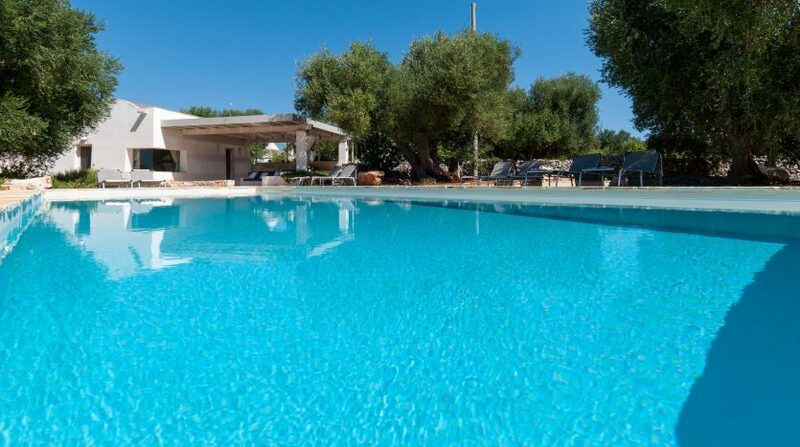 Trulli Tra Pietre is the ideal choice for large families or groups of friends who want to lose themselves in the most genuine Apulia without relinquishing luxury, comfort, and an enviable and constant privacy. 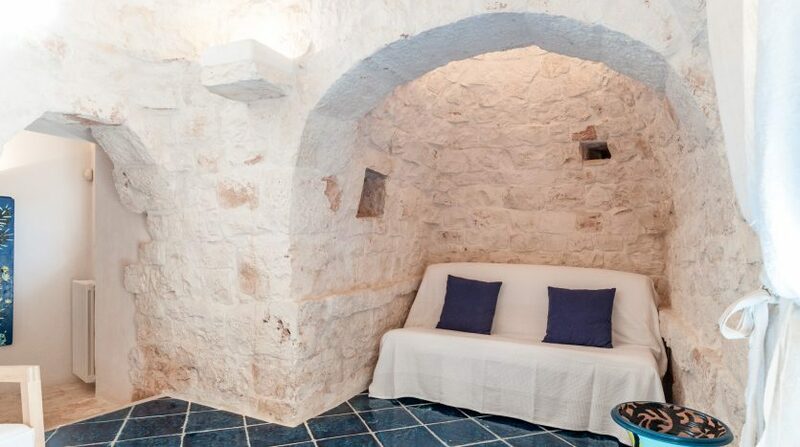 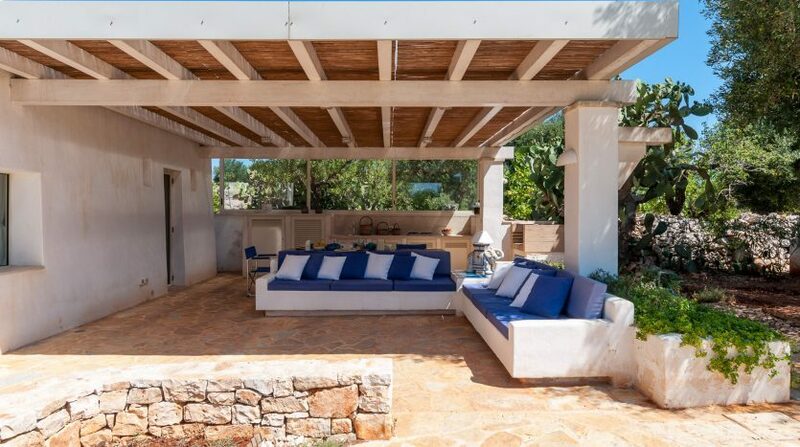 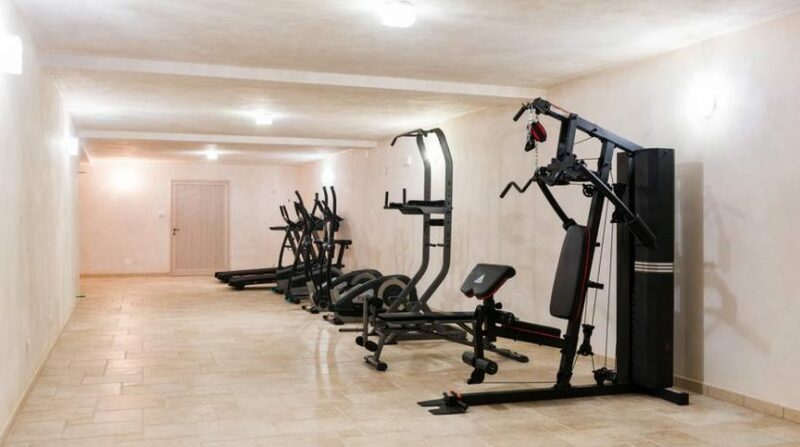 Different tariff conditions enable you to also book just 9 beds in this property (namely without the annex). 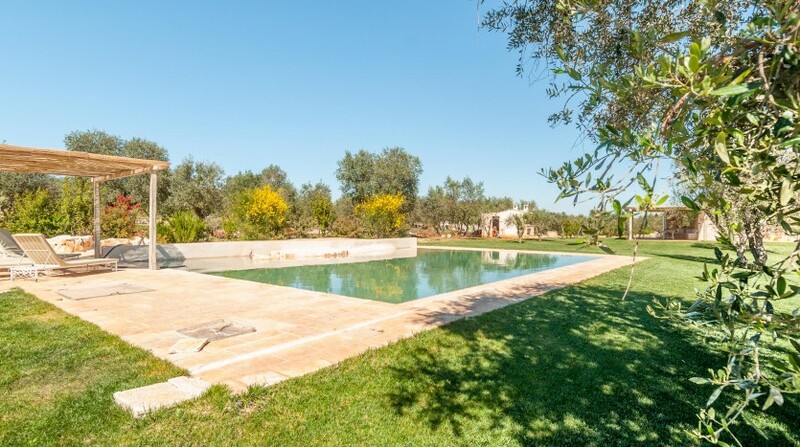 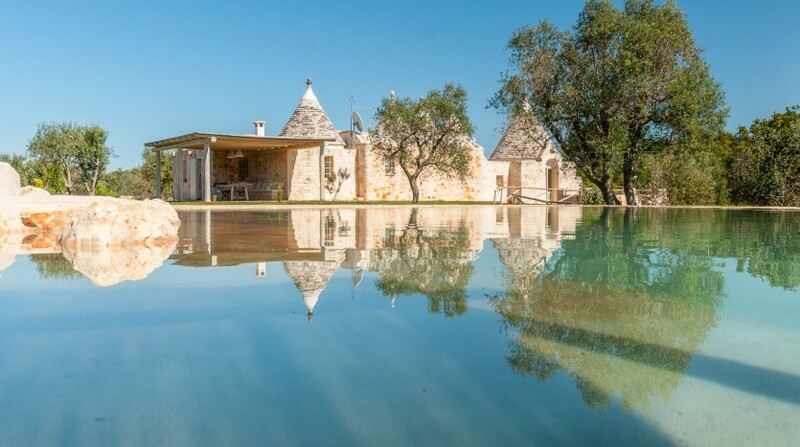 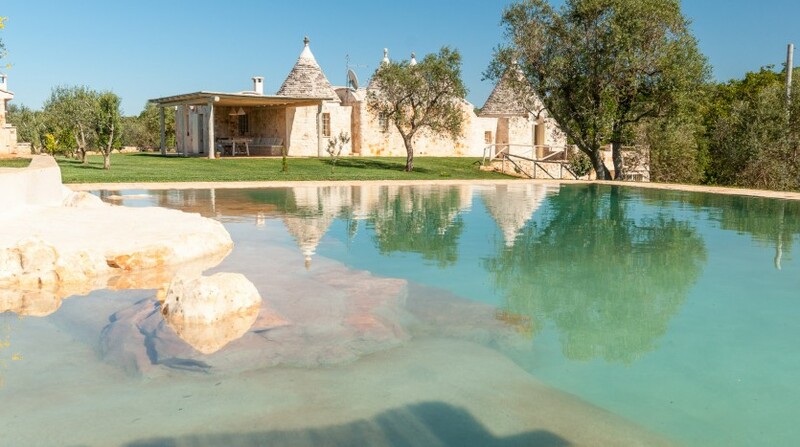 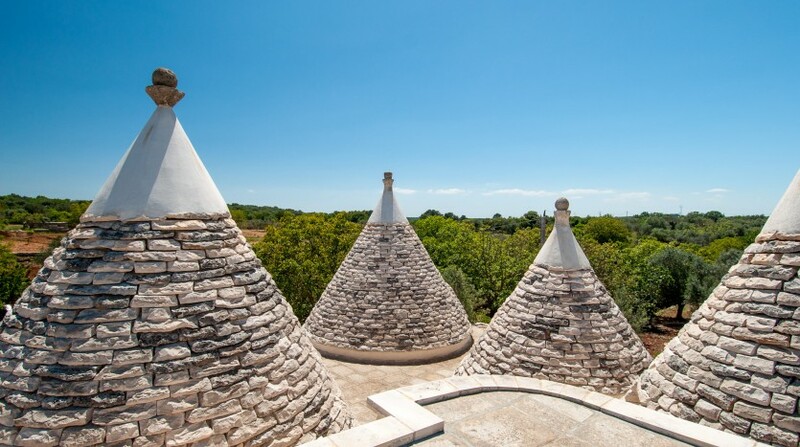 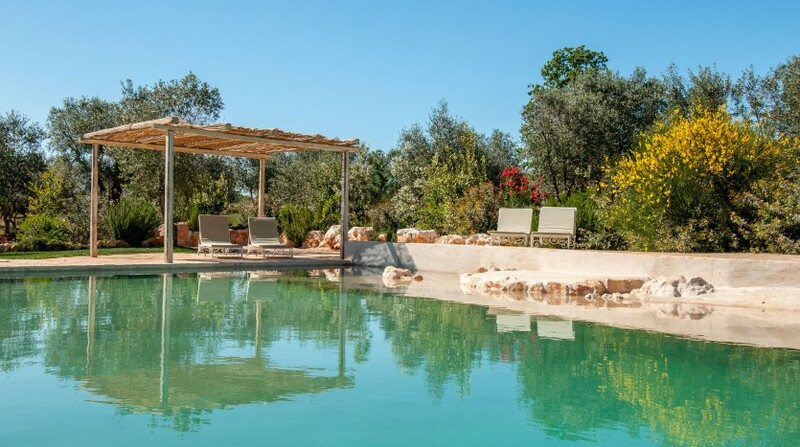 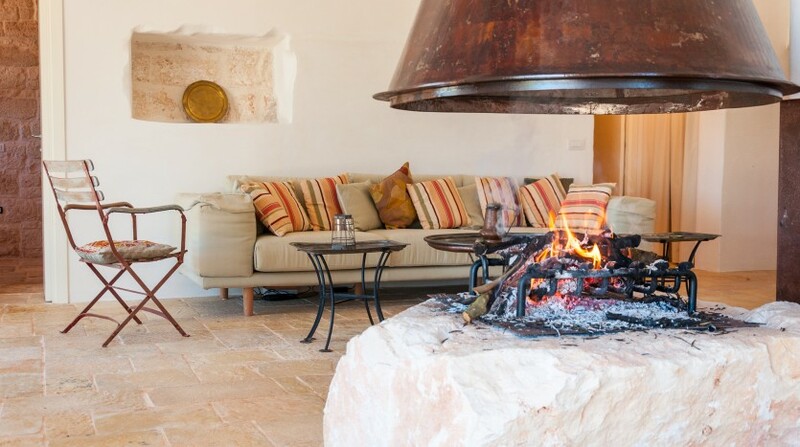 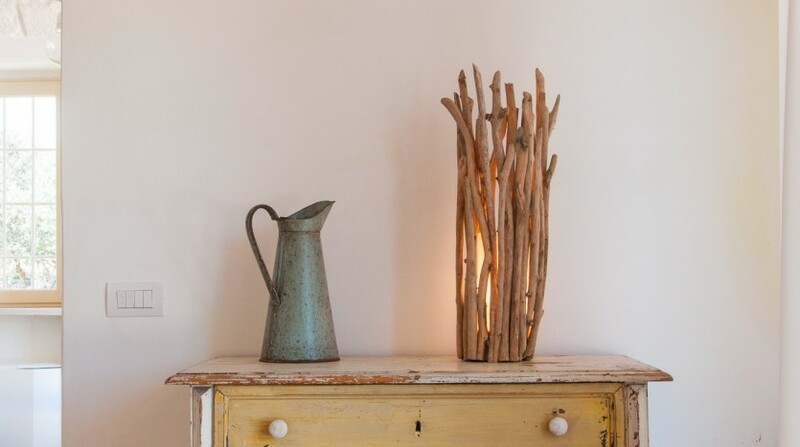 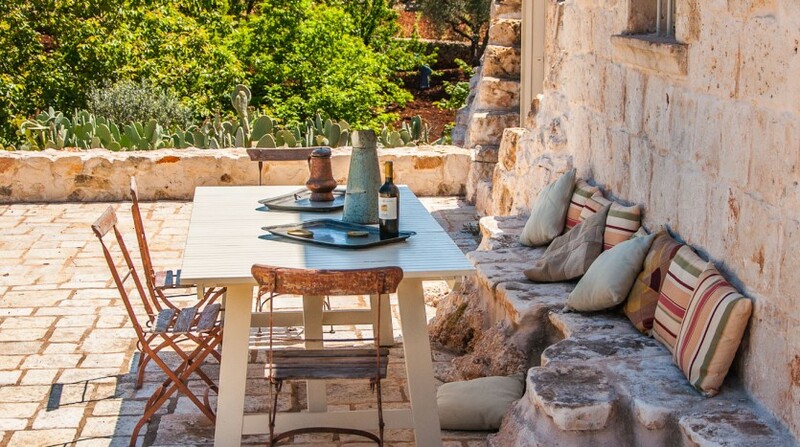 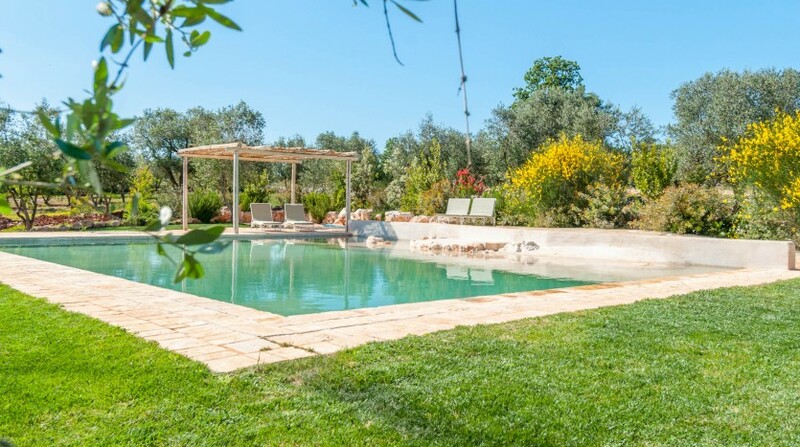 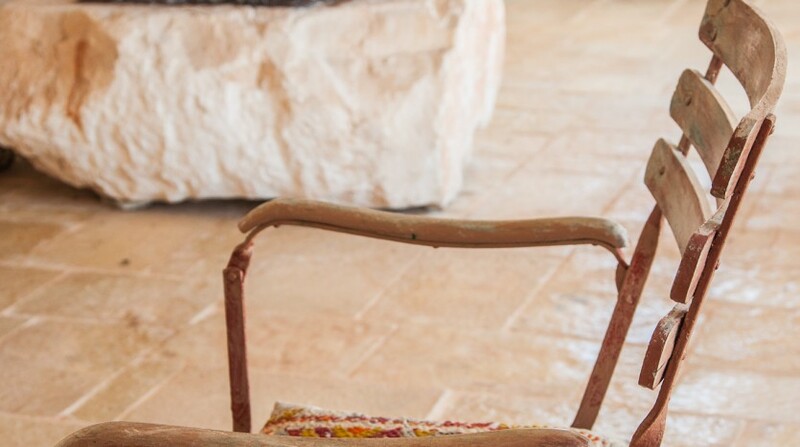 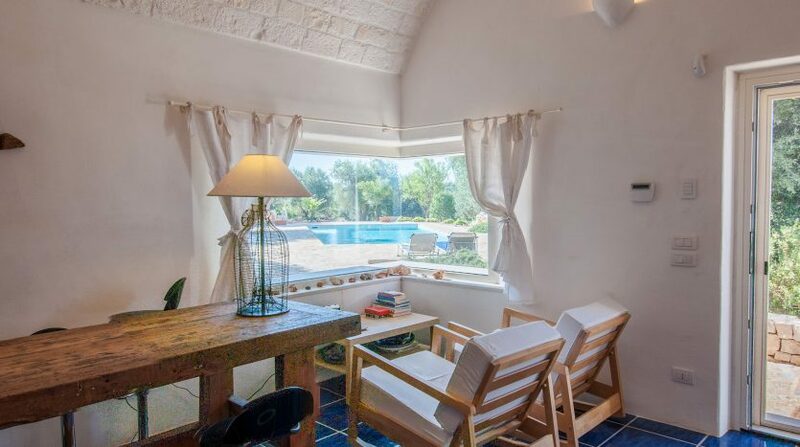 Trulli tra le pietre is immersed within the natural beauty of the unspoilt Valle d’Itria, a quiet setting where you can enjoy your holiday in complete relax. 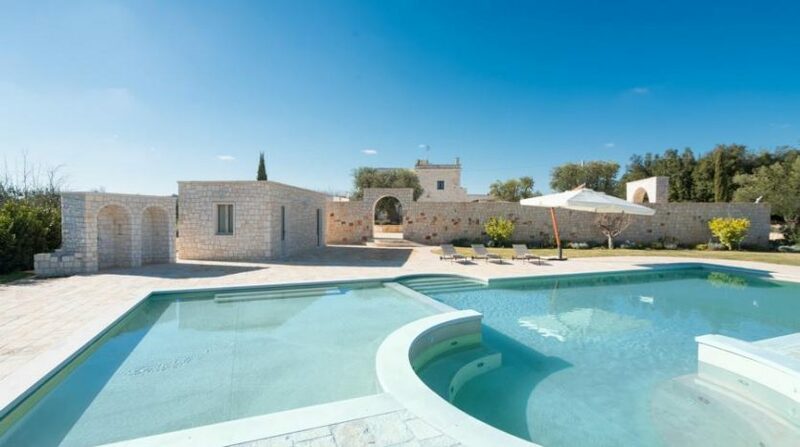 But don’t forget to take some time to visit some of the wonderful sights of the whole region, that you’ll find not far from this wonderful villa: the characteristic town of Cisternino, located on a hilltop; Ostuni, the famous “White city”; Martina Franca, renowned for its baroque architecture; Alberobello, the capital of the folkloristic trulli; Fasano, with its celebrated ancient farmhouses (“Masserie”); the caves of Castellana and then of course the charming Salento district. 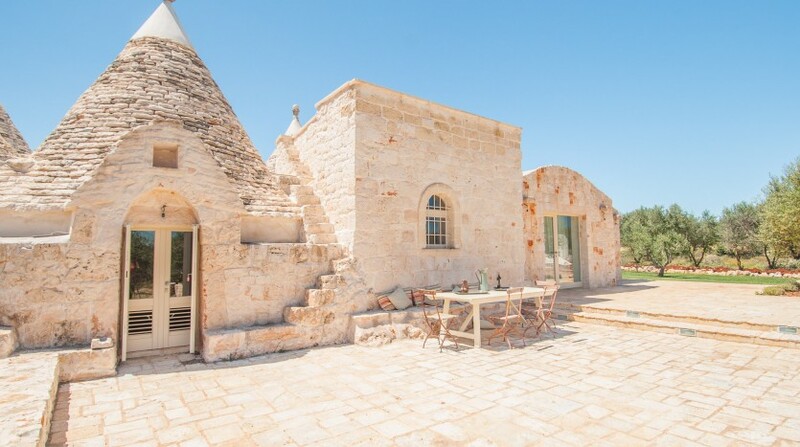 A whole new way to spend your holidays in Puglia: exclusive, elegant and within a welcoming atmosphere. 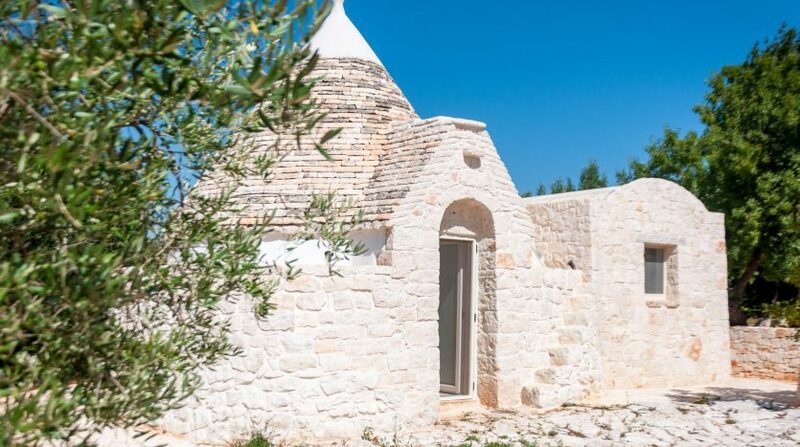 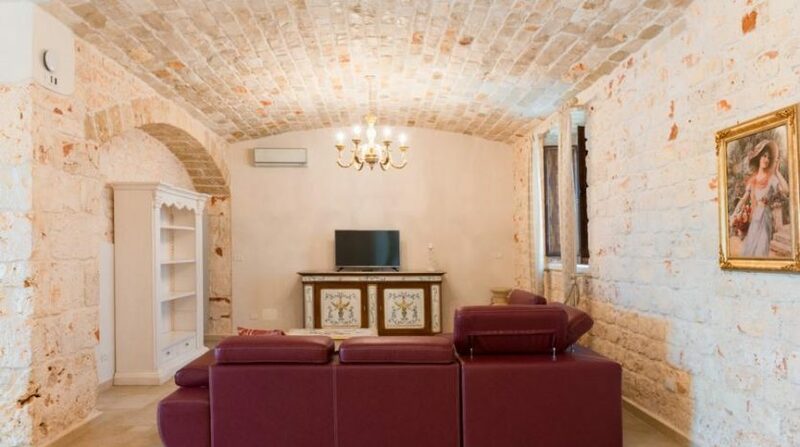 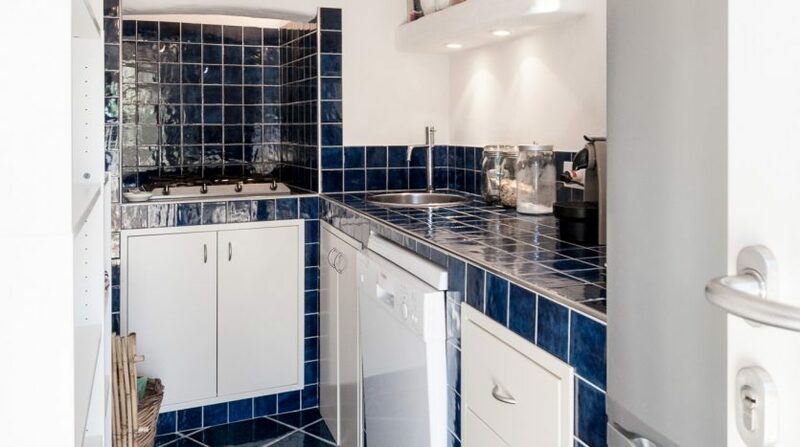 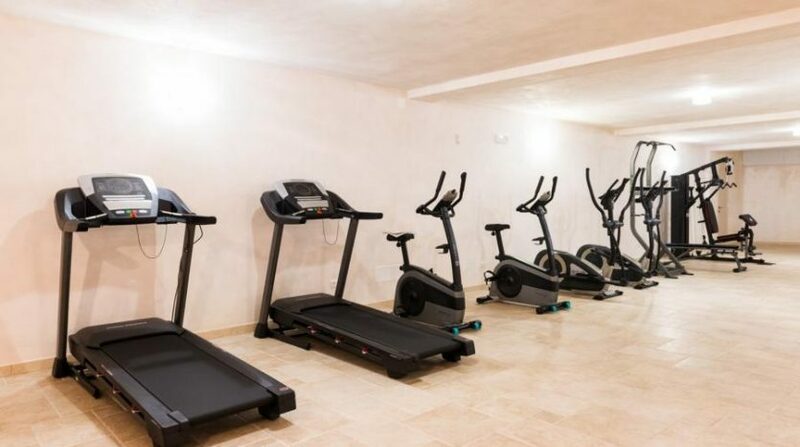 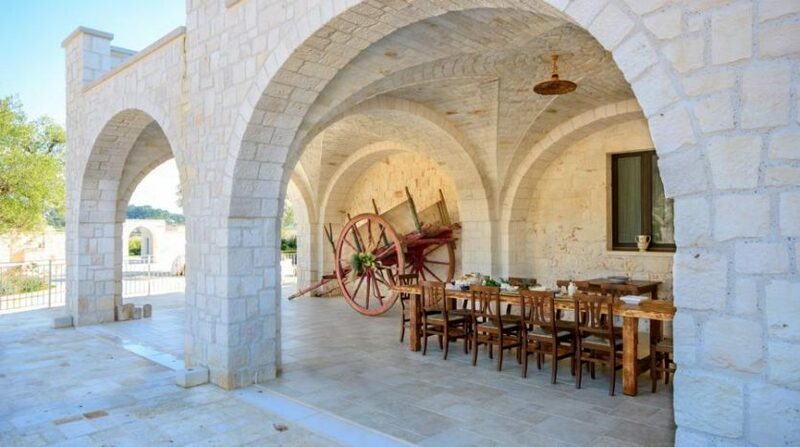 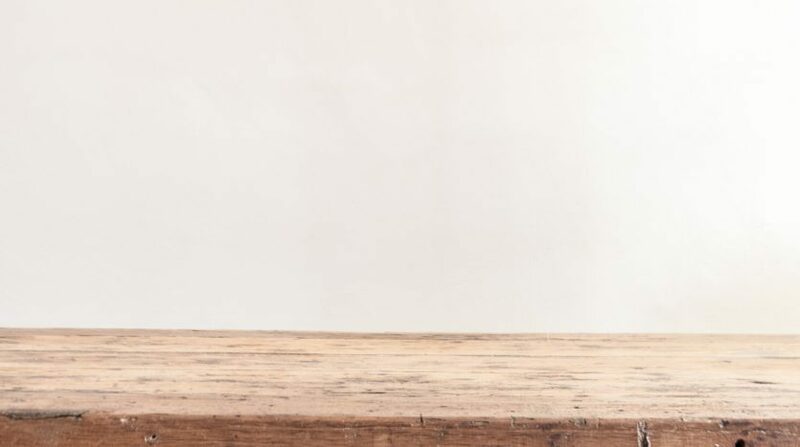 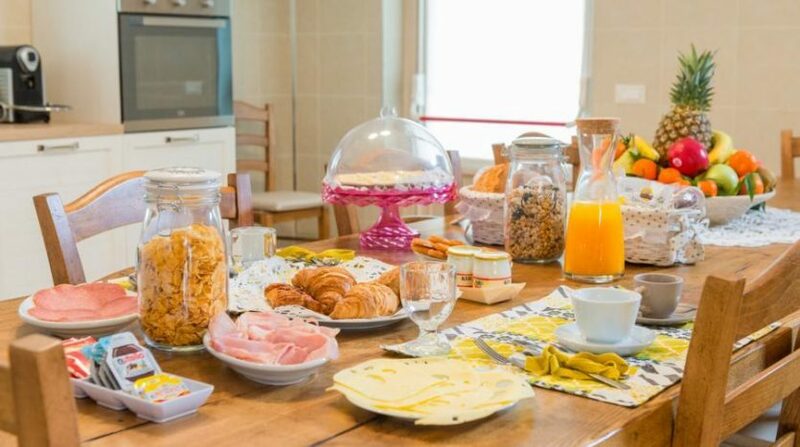 Address: White city Ostuni, Ceglie Messapica the capital of the cuisine of Apulia, Alberobello,the capital of Trulli, the beautiful towns of Cisternino and Locorotondo,Salento.